· How to make BUUZ? HALIFAX, NOVA SCOTIA--(Marketwired - Feb. 23, 2017) - Erdene Resource Development Corp. (TSX:ERD) ("Erdene" or "Company") is pleased to announce the closing of its previously announced bought deal financing for gross proceeds to the Company of C$13.8 million (the "Offering"). The Offering was led by Paradigm Capital Inc., with a syndicate including Canaccord Genuity Corp. (collectively, the "Underwriters"). The Company issued an aggregate of 17,922,077 common shares ("Shares") at a price of C$0.77 per Share, including the full exercise of the Underwriters' 15% over-allotment option. The Offering was oversubscribed with participation from multiple institutional investors from Canada and abroad. In consideration for their services, the Underwriters received a cash commission of $828,000 representing 6% of the gross proceeds of the Offering and 1,075,324 compensation warrants (the "Compensation Warrants") representing 6% of the Shares issued pursuant to the Offering. Each Compensation Warrant is exercisable for a period of 24 months from closing and entitles the holder to purchase one Share for $1.20 per share. All Shares issued in connection with the Offering are subject to a four-month hold period expiring June 24, 2017. The Company intends to use the net proceeds of the Offering to advance its 100%-owned, high-grade Bayan Khundii and Altan Nar Gold Projects, and to further explore and develop the Company's other gold properties in southwest Mongolia, as well as for working capital and general corporate purposes. An approximate 20,000 metre drill program at Bayan Khundii is expected to commence in April 2017. "We are extremely pleased with the strong interest shown in the financing which was significantly oversubscribed. It is our pleasure to welcome these high caliber shareholders into Erdene", said Peter Akerley, Erdene's President and CEO. "We now have the financial capacity to significantly advance our promising gold projects in southwest Mongolia." The securities described herein have not been, and will not be, registered under the United States Securities Act of 1933, as amended (the "U.S Securities Act"), or any state securities laws, and accordingly, may not be offered or sold within the United States except in compliance with the registration requirements of the U.S. Securities Act and applicable state securities requirements or pursuant to exemptions therefrom. This news release does not constitute an offer to sell or a solicitation to buy any securities in any jurisdiction. February 22 (CNBC) Coal miners operating in Mongolia are betting on China's massive 'One Belt, One Road' program to improve access to existing markets in China and Russia and enter new ones as far afield as Eastern Europe. Although Chinese demand for coking coal, or metallurgical coal – a key steelmaking ingredient – has recovered, infrastructure constraints in Mongolia, particularly a lack of rail capacity continues to cause 'bottlenecks' and delays in getting product to markets, said David Paull, managing director of ASX-listed Aspire Mining Ltd. In the longer term, China's efforts to re-invent the Silk Road trading route for the modern era, connecting Asia to the Middle East and Europe will shift the balance. "One Belt, One Road and investment in Mongolian rail will provide capacity' allowing greater penetration of the Chinese and Russian markets 'and eventually Eastern Europe," Paull told CNBC in a telephone interview on Feb. 21. Despite the longer-term appeal of new growth markets, Mongolian-focused miners like Aspire remain cautious. "The coking coal market certainly has stabilized," Paull said. "The capital markets were completely closed to us" during the depths of the commodity price collapse in 2014. "We reduced ourselves to a skeleton crew to keep ourselves in the game. We're still very much in that mode but more confident in sources of funding if you can point to the fact you can move to the development stage quickly." In the near term, China's ban on North Korean coal imports is boosting demand for Mongolian coking coal, said Thomas Hugger, founder and CEO of Asia Frontier Capital. "Naturally, Mongolia should be the main beneficiary of this." · I compare Northern Dynasty's Pebble mine vs. Turquoise Hill Resources' Oyu Tolgoi mine. 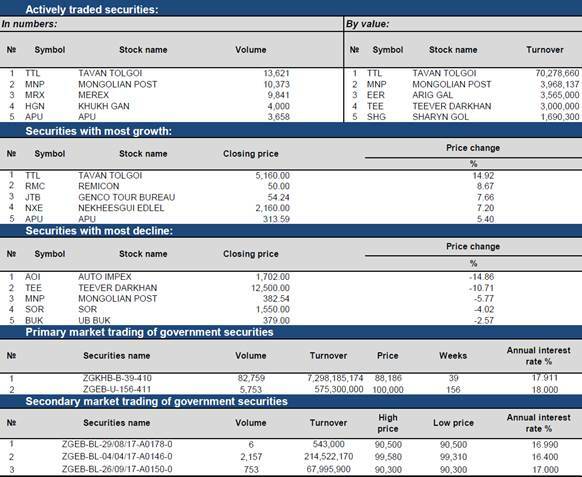 · TRQ's current enterprise value is $9.7 billion and shareholders only own a 32.47% project interest Oyu Tolgoi. The Mongolian gov't owns 34% and Rio Tinto 33.53%. · Pebble Mine has nearly 4X the amount of In-Situ gold and 1.5X the copper. February 22 (Seeking Alpha) In today's piece, I compared and contrast the deposits of Turquoise Hill Resources (NYSE:TRQ) vs. Northern Dynasty (NYSEMKT:NAK), as Turquoise Hill is probably the best comparison given its characteristics and remote location. I will start with Turquoise Hill's Oyu Tolgoi deposit first. Turquoise Hill is an international mining company focused on the operation and further development of the Oyu Tolgoi copper-gold mine in southern Mongolia, which is the Corporation's principal and only material mineral resource property. The Oyu Tolgoi Mine is held through a 66% interest in Oyu Tolgoi LLC; the remaining 34% interest is held by Erdenes. For investors unaware, Erdenes is the Mongolian government. As of the end of December 31, 2015, Rio Tinto (NYSE:RIO) owned 50.8% of the project. In other words, since the Mongolian gov't owns 34% then the remaining 66% project interest is split 32.47% TRQ shareholders and Rio Tinto 33.53%. Let's look at Oyu Tolgoi's reserves and grade. This news release contains forward-looking information that is subject to the risk factors and assumptions set out on page 8 and in our Cautionary Note Regarding Forward-looking Information on page 11. At Mount Milligan mineral reserves and mineral resources are presented on a 100% basis. Sales of gold and copper from the Mount Milligan mine fall under a streaming arrangement whereby Royal Gold Inc. is entitled to 35% and 18.75% of gold and copper sales, respectively. All figures are in United States dollars. TORONTO, ON--(Marketwired - February 23, 2017) - Centerra Gold Inc. (TSX: CG) today issued its 2016 year-end estimates for mineral reserves and mineral resources. Centerra's proven and probable gold mineral reserves increased to 16 million ounces of contained gold (673.4 million tonnes (Mt) at 0.7 g/t gold) from 8.4 million contained ounces (112.5 Mt at 2.3 g/t gold) a year ago. At Centerra's 100% owned Mount Milligan mine in north central British Columbia, Canada, proven and probable mineral reserves are estimated to be 5.8 million ounces of contained gold and 2,049 million pounds of contained copper (496.2 Mt at 0.4 g/t gold and 0.187% copper at an NSR cut-off of $8.12 per tonne). The Company plans to complete and file a new NI 43-101 technical report on the Mount Milligan mine by the end of March 2017. At Centerra's 50% owned Greenstone Gold Project in Canada, the Company announced the completion of the feasibility study for the Hardrock Project in November 2016. As a result of this study, measured and indicated mineral resources on the Hardrock open pit were upgraded to an estimated probable mineral reserve of 70.9 million tonnes at 1.0 g/t gold containing 2.3 million ounces of gold (Centerra's 50% share) at a cut-off grade of 0.33 g/t gold. 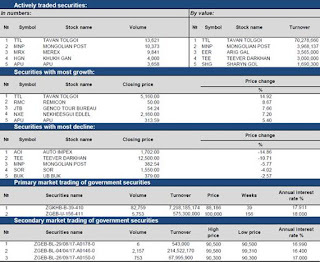 February 23 (MSE) On 23 February 2017, the 39 weeks Government bonds /17.911% annual coupon rate/ and 156 weeks Government bonds /18.000% annual coupon rate/ total worth MNT 7.8 billion traded at Mongolian Stock Exchange. February 22 (MSE) Board of Directors meeting of "Makh Impex" JSC were held on 15 February 2017 and made a decision to distribute dividends to its shareholders with MNT100.00 per share which is total of MNT380.0 million. The ex-dividend day will be set on its annual shareholders meeting of 2017 and payment date will start from 1 October 2017 at "Makh Impex" JSC's building. February 22 (MSE) Board of Directors meeting of "APU" JSC were held on 17 February 2017 and made a decision to distribute dividends to its shareholders with MNT1.00 per share which is total of MNT741.6 million. The ex-dividend day will be set on its annual shareholders meeting of 2017. February 22 (MSE) Board of Directors meeting of "Bayangol Hotel" JSC were held on 17 February 2017 and made a decision to distribute dividends to its shareholders with MNT355.00 per share which is total of MNT150.1 million. The ex-dividend day is 31 March 2017 and the payment will start from 1 September 2017 thought Mongolian Central Securities Depository or "Bayangol Hotel" JSC's building. February 23 (MSE) Board of Directors meeting of "Ulaanbaatar Carpet" JSC were held on 22 February 2017 and made decision to distribute dividends to its shareholders with MNT 75.00 per share which is total of MNT30.3 million. The ex-dividend day is 10 March 2017 and payment will be transferred into shareholders accounts at Mongolian Central Securities Depository between 1 May 2017 and 15 May 2017. February 23 (MSE) "Mongol Daatgal" LLC made a tender offer to buy controlling amount of shares or more of "Khorgo Khairkhan" JSC accordance with the Clause 57.1 of Company Law, the Clause 22.1.1 of Mongolian Securities Law and the Regulation named "To make tender offer to Joint Stock Company" of Financial Regulatory Commission. Address: "Mongol Daatgal" LLC's building, Seoul street, Khoroo#5, Sukhbaatar district, Ulaanbaatar. February 23 (Bank of Mongolia) Spot trade: Commercial banks asked weighted average rate of MNT 2475.98 for USD24.4 million and asked weighted average rate of MNT 353.95 for CNY10.0 million. The BoM bought USD20.6 million with a closing rate of MNT 2476.99. Swap and forward trade: The BoM did not receive any swap offers from commercial banks. February 21 (World Economics) The Headline Mongolian Sales Managers' Index (SMI) was 40.4 in February, an improvement from the level of 38.4 in January. 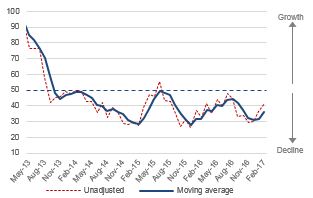 The Market Growth Index in February, when compared the same month in 2016 represents a 7.2 point increase, which could indicate that the Mongolian economy is slowly showing signs of improvement. 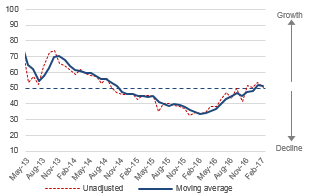 All sub index components of the SMI with the exception of the staffing index registered improving levels in February. The Sales Growth Index is still in contraction territory but there has been an emerging trend of improving conditions, with the rate of negative growth dropping off. Prices charged for new sales are continuing to grow, which suggests higher price inflation is to follow. Managers' report that the price increases have had a minimal impact on profit margins, indicating higher input costs are the driving force. The fast approaching Mongolian Lunar New Year and mild winter weather has given businesses a slight respite from the challenging conditions in February. Ulaanbaatar, February 22 (MONTSAME) In January 2017, 1622.1 thousand tons of freight and 207.8 thousand persons (double counting) were carried by railway transport. Compared to the same period of the previous year, the number of carried freight has decreased by 34.7 thousand tons (2.1%) and the number of carried passengers has decreased by 17.7 thousand persons (7.9%). The revenue from railway transport reached 32.5 billion which has decreased by MNT 1.2 billion (3.5%) compared to the same period of the previous year. In January 2017, 210.3 tons of freight and 53.1 thousand persons (double counting) were carried by air transport. 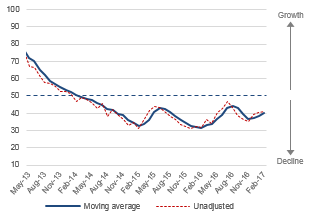 The volume of carried freight decreased by 13.5 tons (6.0%) and the number of carried passengers increased by 6.6 thousand (14.1%) compared to the same period of the previous year. The revenue from air transport reached 20.2 billion which has increased by MNT 1.3 billion (7.1%) compared to the same period of the previous year. February 22 (gogo.mn) On 19th Feb, 2017, International Monetary Fund (IMF) and Government of Mongolia have reached staff-level agreement on an economic and financial program to be supported by a three-year Extended Fund Facility for $440 million, as part of a $5.5 billion external financing package. As a result, Mongolian external debt to GDP ratio will be doubled than the international average while it has forecasted to reach 86.3 percent of GDP by 2017. On the other hand, some tax rates will be increased including excise taxes on vehicle, alcoholic products and tobacco as well as social insurance premium and personal income tax starting 1st of April, 2017 required by the IMF`s Extended Fund Facility program. However, requirements related to increase of tax rates, new tax and social issues regarding salary and pension are irritating public. Thus we clarified the position of Mongolian professional economists on IMF`s Extended Fund Facility program. -I think it is the best action to overcome economic crisis. Mongolia was facing lack of discipline and financial accountability. Unfortunately, Mongolia has established an agreement with IMF after reaching its final stop to face economic collapse. IMF talks mainly about budget and monetary policy. However this time they suggested new proposal to conduct complex audit on the operation of commercial banks and financial system. Because they consider that it is not working well. IMF`s program is the only thing can fix it. If the Government of Mongolia fulfill the obligations required by the IMF on time, very positive result is awaiting us. Collapsed economy shall be restored with strict requirements. -IMF`s program seems quite reasonable for me. IMF has eased the loan requirements in the last five years. However we should notice that what terms and conditions are hiding behind. It is significant for us to know all requirements even it is hidden. IMF demanded to tax interest income on personal savings accounts and I think it is right. However, increasing social insurance premium and retirement age are wrong decision. -World Bank and IMF have ruined Mongolian economy. We must acknowledge it at all levels. Reaching an agreement with IMF means that they are going to repay the previous loan that collateralized by Mongolian people with the people too. IMF have already became bankrupt at the end of 1990s. They take others money and make economic and political ultimatum. IMF has not developed any countries as they promised. Stopping all policies directed to social support might worsen Mongolian economy. -There are no good news about IMF. We have been cooperating with the IMF since 1998. They are always causing fall in Tugrik rate. All countries that cooperated with the IMF went into debt. Extended Fund Facility program was implemented previously in Russia, Ukraine and Egypt which brought negative results, causing currency fall. Salary, pension, benefits will depreciate in Mongolia after the program and the country will trap in poverty. I think it is the program to make Mongolia as a geopolitical subsidiary place against Russia and China through economic and financial method. February 25 (The Economist) WHEN Jim Anderson first lived in Mongolia in 1993, there was one local word foreigners could not help but learn: baikhgui, which translates as "absent" or "unavailable". Bread? Rice? Electricity? Often as not, they were baikhgui, he recounts in a blog post for the World Bank, for which he has returned to Mongolia as country director. Even those lucky enough to have American currency to spend in "dollar shops" received sticks of chewing gum as change. Mongolia thought it had left those days far behind. A mining boom (copper, coal, gold) has transformed the country, filling the shops with goods and the cities with cranes. From 2009 to 2014, the economy grew by 70%. In 2012 alone, it attracted foreign-capital inflows equivalent to some 54% of its GDP. But since 2014 commodity prices have fallen, foreign-direct investment has reversed and a number of daunting debt payments have crept closer. Mongolia's foreign reserves have dwindled from over $4bn in 2012 to little more than $1bn at the end of September, equivalent to about four months' imports. Foreign creditors were about to learn the word baikhgui. Enter the IMF. This month it agreed to lend Mongolia about $440m over three years to help it avoid default and rebuild its reserves. Assuming the agreement is approved by the fund's board, it should unlock another $3bn or so from the Asian Development Bank, the World Bank, Japan, South Korea and others. China should also help. Irked by the Dalai Lama's visit in November, it imposed new duties on Mongolian goods and delayed lorries at the border. A little over 50% of Mongolians identify as Buddhist. But almost all the country's exports (84%) are sold to China, making it the most China-dependent exporter in the world (see chart). Mongolia's government has apologised for the "misunderstanding" caused by the visit and said it will not permit a repeat. It now hopes China will extend a 15bn yuan ($2.2bn) swap line. The strings attached to the IMF's loan are more conventional. They include keeping the central bank out of "quasi-fiscal" activities: it had bought cheap-rate mortgages worth 1.95trn togrog ($787m), helping to support a housing bubble in a country known for nomadism. At the IMF's urging, the government is also distancing itself from the management of the Development Bank of Mongolia, a state lender that accounts for over a fifth of credit in the country. Mongolia's prospects should improve. Copper and coal prices have recovered somewhat. The economy will also benefit from heavy investment in Oyu Tolgoi, a copper mine operated by Rio Tinto. But Mongolia has turned to the IMF twice in eight years. If it does not manage the next commodity cycle better, it might find that its benefactors' patience is baikhgui. This article appeared in the Asia section of the print edition under the headline "This might yurt"
February 22 (news.m) The Independent Authority Against Corruption of Mongolia has arrested two former members of parliament, namely N.Batbayar and B.Garamgaibaatar on suspicion of wrongly channelling money from the country's sovereign debt fund. 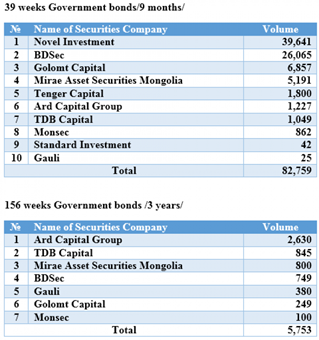 B.Garamgaibaatar is one of the major debtors to the Development Bank of Mongolia. N.Batbayar, then Minister of Economic Development was arrested on charge of abuse of power and embezzlement of Samuria and Chinggis bonds. February 23 (gogo.mn) At the regular Cabinet meeting held today on February 23, 2017, a draft budget amendment has been discussed. Having reviewed the budget amendment formulated and submitted by the Ministry of Finance, the Cabinet has backed it and it will be submitted to the Parliament shortly. Sources said, the irregular session of the Parliament would be called most probably soon after the Lunar New Year-Tsagaan Sar. This step is one of the prior actions reflected in the IMF's "Extended Fund Facility" program. February 23 (news.mn) The Economic Standing Committee has established a working group for examining the operations of the Central Bank of Mongolia, also known as Mongol Bank, between the years 2012-2016. The working group will undertake its study over 30 days. They intend to probe into national currency exchange rate stability, the price stabilising programme, financed projects and the results of operations. Ulaanbaatar, February 23 (MONTSAME) Democratic Party group in Parliament considers that International Monetary Fund has underestimated the situation of Mongolia and it has a position against receiving IMF's Extended Fund Facility program. On February 22, DP group held extended meeting and discussed some pressing issues relating to IMF's program and Development bank. "- Raising rates of individual income tax and contributions of social insurance is not acceptable amid economic difficulties. They paid much more attention in increasing the budget revenue rather than saving the budget expenditure. We observe that IMF has underestimated the situation of Mongolia. Total external financing package within the program will be around USD 5.5 billion, while, the DP - we took a total loan of USD 1.5 billion when in power. They should explain for what the remaining USD4 billion would be spent. Stage budget was sustained within MNT6-7.6 trillion, now it reached to MNT9 trillion, when MPP is in power. It shows there is possibilities to cut expenses." said DP group head D.Erdenebat. The group considers Mongolia can overcome economic difficulties through proper management of state budget, when price of mining products is growing back in the world market. Ulaanbaatar, February 22 (MONTSAME) On February 21, Tuesday, an academic conference under the theme 'Development of Democracy – Citizen Participation' was co-organized by Presidential Office, Civic Engagement Project of Swiss Agency for Development and Cooperation (SDC), National Legal Institute and School of Law of National University in the Citizen Chamber of State House. The conference was chaired by Ch.Unurbayar, Human Rights and Legal Policy Advisor to President, and addressed a crucial agenda concerning democracy and civic engagement. Presentations were given under themes such as 'Representative democracy, challenges', 'Direct democracy and citizen participation', 'Nature of Mongolian democracy, concerning issues', 'Citizens' initiative rights on local level', 'Political party and engagement of civil society', 'Realization of right to lodge complaints to public organizations and officer', 'Freedom to demonstration' and 'Role of human rights organizations in democracy'. In his closing speech, Ch.Unurbayar appreciated all the presentations given, and added his perspective. The presentations will be compiled for publishing, he informed. February 23 (LehmanLaw) As we posted previously, the Mongolian Law on Pledge of Movable and Intangible Property was adopted on July 2, 2015. This new legislation was supposed to come into force on September 1, 2016. However, effective date of the law had been postponed until March 1, 2017 due to lack of preparation of the required online database for registration of pledges. In order to fully implement this new law, the Ministry of Justice and Internal Affairs, the International Finance Corporation, the Intellectual Property Rights and State Registration Office, the Bank of Mongolia, and other organizations have cooperated to establish an online database for the registry of pledges on movable property and information regarding collateral. According to the law, collateral may be all kinds of stocks, securities, rights to demand, industrial designs, trademarks, all creative works of sciences, arts and other movable properties or intangible assets and present or future movable properties of individuals that are usable and transferable to other's ownership of individuals that is valid and transferable to other's ownership. Under the law, a Pledge will be perfected upon registration of a notice of the pledge with online registry, whether collateral is not transferred to the pledgee's possession or a pledge is created by operation of law. As for movable and intangible assets which have been pledged prior to the new law coming into effect, these collateral need to be registered with the new online database within six months after the entry into force of the law. The new online database shows how Mongolia is utilizing new technologies to make its legal and financial systems more efficient, and will benefit Mongolian citizens and foreign investors alike. The implementation of this law provides a new lifeline for the economy and will create new opportunities in the business sector. Furthermore, information in the database will be available to the public, and registered information will become official records of assets and collateral. February 22 (Human Rights Watch) There's a town in Africa that offers an amazing view of the Mongolian steppes. The picturesque panorama is hand-painted on the patio wall of Rubkona Primary School, in a rural town in South Sudan. The flowing rivers on the wall contrast sharply with the country's brown landscape during the dry season. The school's mural was the most artistic touch in a renovation project carried out by the Mongolian soldiers who make up the contingent of UN peacekeepers sent to protect civilians in the area. At a cost of about US$50,000, the Mongolians renovated nine classrooms and built three new ones. They installed electricity and lighting in all classrooms, and restored desks for the school's 1,534 students. At the re-opening ceremony for the school in October 2013, the Mongolian commanding officer, Colonel Tumendemberel explained that his battalion had chosen projects related to the education of children because they were South Sudan's future presidents, parliamentarians, and governors. Yet, less than two months after this ceremony, no child was attending Rubkona Primary School. A brutal civil war erupted in South Sudan in December 2013, between forces within the army loyal to the president, Salva Kiir, and those loyal to the former deputy president, Riek Machar. The fighting started in Juba, South Sudan's capital, but spread north quickly and reached Rubkona. Within weeks, soldiers from the pro-government side had set up inside the school's classrooms and were using them as a barracks and a base. It wasn't until November 2015 that the soldiers vacated the school and it was finally returned to the students. The fate of Rubkona Primary School is sadly not unique. In wars around the world, government armed forces and non-state armed groups have taken over schools, pushing children out or putting them in the line of fire. Students, teachers, and schools have also been deliberately targeted for attack. Either way, education is a casualty of war. That's why countries from around the world will gather in Argentina on March 28-29, for an international conference demanding safe schools, even during times of war. Attending countries will consider supporting the Safe Schools Declaration—an international political commitment that decries attacks on students, teachers, and schools during war. The declaration outlines a number of common-sense, yet concrete, measures that governments can take to make it less likely that schools will be attacked, and that would mitigate the negative consequences when such attacks occur. Countries that have signed the Safe Schools Declaration seek to deter attacks by making a commitment to investigate and prosecute war crimes involving schools. And they agree to minimize the use of schools for military purposes, such as for barracks or bases, so as to not convert schools into targets for attack. The declaration builds an international community committed to respecting the civilian nature of schools, and developing and sharing examples of the best practices for protecting schools from attack and military use. So far, 57 countries have already endorsed this declaration. Will Mongolia? Mongolian forces that take part in peacekeeping missions already have made a commitment not to use schools in their military operations. And through their support for schools such as Rubkona Primary School, they have already signaled their support for children's right to education, even in countries affected by armed conflict. In March in Argentina, Mongolia's government can show its support too, by endorsing the Safe Schools Declaration. Given Mongolian peacekeepers' efforts in Africa, it should be an easy choice. Summary: Parliament's Legal Standing Committee and the Ministry of Justice and Internal Affairs organized the Mongolian Law on Arbitration and International Standards conference. Minister of Justice and Internal Affairs S. Byambatsogt stated, "The Law on Arbitration was revised to develop the legal framework of Mongolia, considering the unique environment of the country and its business environment with respect to international standards, and a new version of the law is in effect. With the approval and implementation of the law's amendments, business entities will have the legal right to determine the laws and regulations used to settle their disputes. This shows that Mongolia's arbitration process has reached international standards." During the conference, Chairman of the American Chamber of Commerce Jay Liotta gave a presentation on the law and the impact of the new amendments on foreign investors. Summary: The Independent Authority Against Corruption has detained former Member of Parliament B. Garamgaibaatar and former Minister of Economic Development N. Batbayar on the suspicion of abuse of power to receive large loans from Development Bank of Mongolia. Sources claim that B. Garamgaibaatar's company Monroad received around 30 billion MNT to construct a 100 km road. Former Executive Director of Development Bank N. Munkhbat has also been detained, and is being questioned about the alleged misuse of Chinggis and Samurai bond financing. Summary: The price of coking coal price rose by 2.4%, reaching 153.60 USD. Mining.com reported that China's decision to stop importing coal from North Korea affected the price of coal. In 2016, China imported 22.4 million tons of anthracite coal from North Korea, an increase of 15% compared to 2015. China imported 59.2 million tons of coal in 2016, and Australia is the nation's biggest exporter at 26.8 million tons of coal purchased, an increase of 4.8% compared to 2015. In 2016, Mongolia exported 23.6 million tons of coal to China, an increase of 85%. 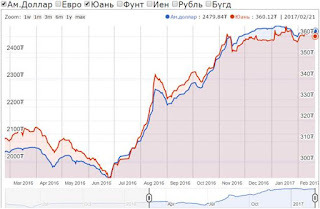 Last December, the price of coking coal from Mongolia sold to China was 63 USD per ton, while coal traveling by ocean reached 230 USD per ton. Summary: Speaker of the Parliament M. Enkhbold received Japan's Deputy Minister of Foreign Affairs Takeo Akiba. During their meeting, Akiba noted that the consultative meeting held between the two countries' Ministries of Foreign Affairs was successful, and that he was happy that Mongolia successfully negotiated with the IMF. In commemoration of the 45thanniversary of diplomatic relations between Japan and Mongolia, the two sides discussed the Speaker of Parliament's upcoming official visit to Japan. Akiba noted that Japanese companies are interested in being involved in the management of the new international airport in Khushig Valley. M. Enkhbold stated that the previous parliament's decisions must be implemented, and that an important factor in establishing agreements for the airport is that service fees must be fair to the Mongolian people. Summary: Development Bank of Mongolia's bond released in 2012 has exceeded the 100 USD mark in the secondary market, its highest price since June 2013. The Ministry of Finance proposed that the bond's holders exchange the bond for a new government-backed bond, the Khuraldai. Credit Suisse and JP Morgan have been employed as the new bond's underwriters, and sources claim that a meeting with Asian and European investors is set to take place shortly. The 580 million USD bond was originally released with a 5.75% interest rate, and the new bond's interest will be paid semiannually. The bond's interest rate is still unknown, but investors will be able to extend terms and make amendments to their contracts, while the holders of the old bond will not be able to resell it. If investors choose not to exchange their bonds, Mongolia will still have to pay the bond's debt. February 23 (news.mn) The President of Mongolia, Mr Ts. Elbegdorj, has presented the National Development Award – the State Gerege" in a ceremony held earlier today at Government House. This year, the recipients were 'Gobi' LLC and 'Erdenet Carpet', which received the 'National Superior Creation Award'. 'The State Gerege' is presented for an outstanding creation or work that has became a role model in the social, economic and intellectual life of the country. The award ceremony is always held right before the Mongolian national festival of 'Tsagaan Sar' (Lunar new year),. Established in 1981 by the combined efforts of the Mongolian and Japanese governments, 'Gobi' was the first Mongolian luxury knitwear brand to break into the European, Japanese and the US markets in the last century. Since it started operating, 'Gobi' has become one of the top 85 manufacturers in the world specialising in cashmere, camel wool and yak down products. "Erdenet Carpet" LLC, is both a production and trading company, and was established using equipment from Germany, Japan, Great Britain, Poland and Russia - also in 1981. The company has been operating for more than 33 years and manufactures wool carpet and carpet products using state-of-the art technology. 'Erdenet Carpet' manufactures six types of 80-100% sheep wool carpets with over 1900 designs including contemporary, classic and modern images. February 23 (Mongolian Economy) It has been decided that MNT 55,000 will be the going rate for each tonne of first-grade quality wheat supplied by citizens and legal entities to domestic flour plants and the Crop Farming Support Fund in order to support wheat production. The incentive will be MNT 50,000 per tonne for 2nd-4th grade wheat. Last year, wheat was planted on 355 thousand hectares of land nationwide, with 460 thousand tonnes harvested. A total of 292 thousand tonnes of standard quality food wheat was harvested, and the Crop Farming Support Fund acquired 68.5 thousand tonnes of it. The national resource sector acquired 0.1 thousand tonnes and flour industries 224 thousand tonnes. The significance of this is that flour demand can be ensured domestically and that the price of flour and flour products can be stabilised. This year, MNT 16 billion in the state budget will go towards food wheat incentives, with 729 citizens and entities from 65 soums of 12 provinces having met the requirement to receive the incentives. Ulaanbaatar, February 22 (MONTSAME) On February 21, a seminar was held at the National Chamber of Commerce and Industry to discuss the expansion of Mongolia-Japan trade in connection with bilateral Economic Partnership Agreement taking effect. Mitsuaki Hoshino, Director of Northeast Asian Division at the Japanese Ministry of Economy, Trade and Industry addressed the meeting and said, "In recent years, high level meetings have been frequently held between Japan and Mongolia, and I think, it shows the depth of bilateral relationship and cooperation". The Ministry of Economy, Trade and Industry of Japan in cooperation with the Embassy of Japan in Mongolia has conducted a study, assessing three products – cashmere, sea buckthorn and dairy products which were considered to have the highest export potential. The study aimed to continually expand bilateral trade with not only minerals but other products, and explore how conventional agriculture can be developed in Mongolia and Japan. The study was launched on October 12, 2016. Engaging 13 public and corresponding organizations, 17 private sector companies and 3 specialists, the study unveils the current state of Mongolian cashmere, sea buckthorn and dairy products industries, and challenges in exporting the products to Japan. The study identified some solutions for successful export of cashmere such as improving quality control, production control and monitoring skills, launching a brand suitable for customer demand, ensuring stability and information on all procedures until the product is ready for use and learning marketing know-how in Japan. The study also found three forms in which Mongolian sea buckthorn can be exported to Japan which are raw material, oil and oil powder. The current state of Mongolian dairy industry was assessed by the study which concluded that although the nutrient quality of Mongolian milk is high, all-year stable supply is difficult because of the shortness of dairy season which is from July to September. Generally, the study concluded with certain recommendations which include improving quality control, enhancing workforce capacity, consistently participating in expositions, business meetings and business matching, consistently updating on the activities of Mongolian companies and introducing a management to realize Japanese marketing strategies. Ulaanbaatar, February 22 (MONTSAME) - The Government approved a regulation on issuing license to use mining dumps, and a regulation on running activities using mining dumps and requirements to the activities. Mining companies make dumps during mining process by displacing the waste rock or other material that overlies an ore or mineral body and the materials left over after the process of separating the valuable fraction from the uneconomic fraction of an ore, in the mining field. AmCham Mongolia is pleased to announce our second annual Corporate Social Responsibility (CSR) initiative, AmCham Mentor Day 2017. AmCham Mentor Day 2017 is a day-long mentoring event giving students the opportunity to learn from the nation's top business leaders and attend workshops on career development, confidence building, and teamwork, as well as resume development, led by the human resource directors of Mongolia's leading companies. AmCham members will have the exclusive opportunity to engage in this worthy CSR initiative through sponsorship and volunteering. Please contact Mr. Munkhjargal, Director of Events for AmCham Mongolia, at munkhjargal@amcham.mn or 9999-7104 regarding sponsorship and volunteer opportunities. The event agenda will be announced soon. Join the AmCham Mentor Day 2017 event page on Facebook to receive timely updates. February 22 (Global Times) Mongolian herdsmen have started using a unique service supported by China-developed Beidou system this year to track their camels, stallions and other livestock, media reported on Wednesday. Studhorses, camels used for breeding and rams are now equipped with the navigation system, so that herdsmen can learn the number of their livestock, their location and living conditions, a senior Mongolian herdsman was quoted by the Science and Technology Daily as saying on Wednesday. The herding system tailored for Mongolians was jointly developed by Mengke Beidou Electronic Technology Co in Erdos of North China's Inner Mongolia Autonomous Region and the National University of Mongolia in Ulan Bator. The system has already been promoted in four banners (counties) of Erdos. "Unlike Inner Mongolia, the geographical and climate conditions in Mongolia are poorer, posing bottlenecks for the promotion of the system," said Zhao Lu, a manager from Mengke, adding that the tailored system also uses the Mongolian language. The herding system is expected to be popularized in countries along the Belt and Road initiative, such as Kazakhstan and Tajikistan, the Science and Technology Daily reported. Named after the Chinese term for the Big Dipper, the Beidou satellite navigation project began in 1994, some 20 years after GPS, the Xinhua News Agency reported. A regional Beidou network has taken shape, providing positioning, navigation, timing and short message services for China and several other Asian countries, reports said. February 23 (news.mn) 'Khaliun Tugul' LLC has established first ever Mongolian Bankers Club in Ulaanbaatar. Known simply as the 'Bankers Club - UB', it offers a venue for respected banking executives and their private guests to meet and undertake a range of activities. The prototype is the 'Bankers Club of Chicago', which was established 133 years ago in 1882 and is the world's oldest such institution. It describes its own aims as providing 'a forum for prominent bankers in the area to discuss issues of importance to the financial landscape of Chicago as well as the community at large'. February 22 (Mongolian Economy) The 2017 Ulaanbaatar Investment Forum, jointly organised by the Ulaanbaatar City Mayor's Office and Ulaanbaatar Chamber of Commerce, took place on Monday. The main purpose of this meeting is to support the economic development of the capital city, protect the rights of entrepreneurs, develop public-private partnerships and create a more favourable investment and business environment for people and businesses. Ts.Sandui, Head of the Ulaanbaatar City Citizens' Council, opened the meeting with his speech in which he stated that the "city authorities are paying particular attention to the implementation of policy that will develop the city the right way. In order to realise this policy, we have declared this year as a 'year of legal reform with public participation' and developed two new laws related to creating new legal environment for the city." "Projects and programmes amounting to USD 319.3 billion will be implemented through funds from the national and capital city budget investments, concessions and the Development Bank, and MNT 359.8 billion by funds from foreign loans and grants in accordance with the 2017 the national and capital city budget. Performing all the works and events included in the budget in timely manner, as well as boosting investment and their benefits, is one of the most important goals. We hope that our meeting will play significant role in attracting the attention of foreign and domestic investors on the development priorities of the city." "A total of MNT 677.5 billion in investment will be implemented in the capital city, including MNT 69.6 billion worth of investment from the state budget, MNT 174.4 billion from the capital city budget, MNT 64.3 billion from the Development Bank, MNT 12.1 billion from the local development fund and MNT 356.9 billion from aid." "A total of MNT 4 .9 trillion in investment is needed in order to build 150 high-tech plants in Nalaikh, Baganuur, Bagakhangai and Emeelt, which will create 15 thousand new jobs." "We are aiming to reduce population concentration and become a 'multi-centre' city." "Six sub-centres will be built in 3 phases in places such as Selbe, Bayankhoshuu, Dambadarjaa and Denjiin 1000 through a USD 320 million soft loan from the Asian Development Bank." "A total of MNT 2.1 trillion is needed in order to build residential apartments for 18 thousand families as well as service and trade facilities that will create 14 thousand jobs in new settlement areas. " "A total of 26.8 billion will be spent on construction of ger district engineering networks in 2017." "The construction of the new Yarmag bridge; renovation of the old bridge; construction of bridges at the intersection near the Traffic Police office; construction of a 288-metre steel and concrete bridge over the Tuul River; a 289-metre steel and concrete bridge at Sonsgolon; and expansion of the 20- km Nalailkh-Choir road from the Gachuurt intersection: these will be carried out in 2017 through a USD 132.2 million soft loan from China." "BRT, the special bus lane project, will begin from this spring through a USD 274.4 million soft loan from the ADB." "This year, 3 kindergartens will be built through the state budget's funds, 10 through the capital city budget funds and 5 in the framework of public-private partnerships." "In 2017, the construction of 11 schools will start through MNT 42.7 billion in investment from the state budget, 7 schools through a MNT 39 billion grant from China and 29 within the Ministry of Education, Culture and Science as well as through public-private partnerships." "MNT 3.7 billion will be spent on social welfare, and a 132-apartment welfare housing unit will be commissioned." "MNT 3.6 billion is needed to build 12-14 km of bicycle paths. In 2017, the construction of bicycle paths will begin through MNT 1 billion in investment from the capital city budget's funds." "In 2017, MNT 2.3 billion will be spent on urban beautification technology and equipment, MNT 2 billion on street lighting and MNT 1 billion on an integrated lighting management system." Public private partnerships, economic strategy, investment projects, procurement, transparent tenders, urban development and infrastructure issues were widely discussed during the 2017 Ulaanbaatar Investment Forum. Ulaanbaatar, February 22 (MONTSAME) On February 22, Wednesday, Foreign Minister Ts.Munkh-Orgil held a press briefing to report on his visits to the Russian Federation and the People's Republic of China. On February 13-14, the Foreign Minister paid a visit to the Russian Federation at the invitation of his counterpart Sergey Lavrov. "In brief, Prime Minister to visit China next month, and most importantly, we now have to ensure full execution of our previous agreements. The main purpose of my visit to the Russian Federation was to prepare for Mongolian Prime Minister J.Erdenebat's visit to the country, and we've agreed that the visit will take place within the first half of 2017", the Minister informed reporters. "There are several agreements of significance to Mongolia including the negotiations on rail transit transportation which will be finalized during the Prime Ministerial visit. We've agreed on the concepts to establish a general agreement on Mongolia-Russia energy cooperation, and settle certain matters regarding regional and border area cooperation". "We also talked about the soft loan of USD 1.5 billion from the Russian Federation which Mongolia is keen to spend on rail and energy projects. Moreover, we discussed in detail the issue of hydro power plants in Eg River and Shuren, and resolved to conduct a study whether if the establishment of these power plants will damage or affect the eco system of Baikal Lake", Minister Ts.Munkh-Orgil said about his Russia visit. Ulaanbaatar, February 22 (MONTSAME) On Wednesday, February 22, Foreign Minister Ts.Munkh-Orgil briefed on his visit to the People's Republic of China which took place on February 20-21. "My visit was designated to prepare for Mongolian Prime Minister J.Erdenebat's visit to the People's Republic of China in the first quarter of 2017, and the visit will take place next month. Moreover, Prime Minister J.Erdenebat will participate in the One Belt, One Road international summit by the invitation of President Xi Zinping", he said. "I held talks with Minister of Foreign Affairs Wang Yi, Vice President Li Yuanchao and other officials. Sides have noted with satisfaction that there's no political and social conflict between the two countries", reiterated Foreign Minister Ts.Munkh-Orgil. According to the Minister, 7 Chinese ports are now accessible to Mongolia in frames of the 'Agreement on Mongolia's access to sea and ship transport through China' which has been adopted by the Chinese Government. "There are about 10 intergovernmental agreements to be signed which will be settled during the Prime Minister's upcoming visit. Also, a working group led by Deputy Prime Minister will visit the country", he added. The Foreign Minister said that both the Russian Federation and the People's Republic of China have expressed their support to Mongolia through IMF, Asian Development Bank and World Bank. When asked about the total amount of monetary support from the southern neighbor, he answered, "The Chinese side has agreed to provide a USD 1 billion soft loan and CNY 1 billion nonrefundable aid". Ulaanbaatar, February 23 (MONTSAME) On February 22, Prime Minister of Mongolia J.Erdenebat and Minister of Foreign Affairs Ts.Munkh-Orgil met with Haoliang Xu, the United Nations Assistant Secretary-General, United Nations Development Programme (UNDP) Assistant Administrator and Regional Director for Asia and the Pacific who is on a visit to Mongolia on February 21-25. Prime Minister J.Erdenebat conveyed his gratitude to UNDP for its consistent support for Mongolia in social and economic challenges, highlighted the valuable contribution of the organization in formulating Mongolia's Sustainable Development Vision – 2030, noting that many objectives included in the vision are reflected in the Cabinet 2016-2020 action plan. He also emphasized on how the Cabinet action plan coheres with the 2017-2021 programs of UNDP. Mr. Haoliang Xu remarked upon the advancement of UNDP's cooperation with Mongolia in the last 10 years, expressing his confidence that Mongolia will maintain its sustainable development vision. During the meeting with Foreign Minister Ts.Munkh-Orgil, sides exchanged views on the implementation of Sustainable Development Vision - 2030, reduction of Ulaanbaatar air pollution, intensification of the functions of International Think Tank for Landlocked Developing Countries and further cooperation on urban planning. Ulaanbaatar, February 22 (MONTSAME) On February 21, Parliament Speaker M.Enkhbold received Takeo Akiba, Deputy Minister of Foreign Affairs of Japan, who attended a regular consultative meeting between the Ministries of Foreign Affairs of Mongolia and Japan in Ulaanbaatar. At the beginning of the meeting, Speaker M.Enkhbold pointed out that the consultative meeting was held in success and said "Mongolia and Japan maintains traditionally pleasant bilateral relations and cooperation. Mongolian people always appreciate Japan and its people for their support for us who have been supporting and assisting Mongolia during difficult times". The Speaker then underlined that Mongolian PM J.Erdenebat's visit to Japan and his Japanese counterpart Shinzo Abe's visit to Mongolia last year were of significance in the future intensification of bilateral cooperation in the fields of trade and economy. After expressing his gratitude to the Mongolian Parliament Speaker for receiving him in response, Takeo Akiba, Deputy FM noted "Despite the fact that this is our first meeting, I have known you for a long time. During the visits of former Japanese PM J.Koizumi in 2006 and of Japanese Crown Prince Naruhito in 2007 to Mongolia, I came in Ulaanbaatar as I was working as a Head of First China and Mongolia Division of the Ministry of Foreign Affairs of Japan and met with you when you were the Prime Minister at that time". Takeo Akiba continued by informing that the consultative meeting between Mongolia and Japan was held successfully in Ulaanbaatar, during which he met with D.Davaasuren, State Secretary of the Ministry of Foreign Affairs of Mongolia and agreed that Mongolia and Japan will have a close relationship by regularly exchanging information between the Foreign Ministries and jointly expressing the positions of the two sides during the current times of changing world politics. Ulaanbaatar, February 22 (MONTSAME) A strategic consultative meeting between the Foreign Ministries of Mongolia and Japan was held in Ulaanbaatar on February 21. The meeting was chaired by the State Secretary of Foreign Affairs Ministry of Mongolia D.Davaasuren and Deputy Foreign Minister of Japan T.Akiba. At the meeting, the parties evaluated the current situation of the two countries' relationship and exchanged their views on targets of the near future and midterm. The both parties appreciated that political relations and mutual trust have reached the highest level and emphasized that economic partnership agreement was a historic success in the relationships between the two countries. They agreed on the importance of introducing friendly and trustworthy relationships at the high level into all level. State Secretary of Foreign Affairs Ministry D.Davaasuren expressed that Mongolia gives significance to enrich Strategic partnership relations of the two countries with economic context and increase efficiency of Economic partnership agreement. And he said Mongolia has an aspiration to actively develop the Mongolia-Japan relationship amid the 45th anniversary of diplomatic relations of the two countries this year. The parties agreed that the Foreign affairs Ministries would closely cooperate to establish a new medium term strategic partnership program. Japan acknowledges that Mongolia faces economic difficulties, said Deputy Foreign Minister of Japan T.Akiba and noted that Japan will support Mongolian economic renovation in collaboration with international organizations including the International Monetary Fund. He underlined developing Mongolia and Japan relationship based on principle of being mutually beneficial is essential to become a Strategic partner in real sense. Ulaanbaatar, February 22 (MONTSAME) A project to construct secondary school building will be carried-out by non-refundable assistance from the JICA (Japan International Cooperation Agency). On February 21, protocols in the scope of the project were signed by head of the second group of the project Chee Esaki, research team leader of the project Tomohiro Fukuo, specialist of education planning of JICA Tomohiro Osava and Director of the Department of Finance and Economy of the Ministry of Education, Culture and Science T.Batmagnai. Ulaanbaatar, February 22 (MONTSAME) - A guideline of Mongolian representatives to adhere to in the 7th roundtable meeting of Mongolia and Canada to be held in Ottawa on March 9, was approved. During the roundtable meeting, the sides will discuss the two countries' cooperation in all fields including politics, economy, investment, trade, mining, construction, infrastructure, agriculture, education, culture, defense and humanity and exchange views develop ties in possible areas. Ulaanbaatar, February 23 (MONTSAME) On February 22, heads of state and government of Mongolia hosted a ceremony in State House to greet the heads of foreign diplomatic missions in Mongolia on the occasion of the upcoming Tsagaan Sar celebration. President of Mongolia Ts.Elbegdorj, Parliament Speaker M.Enkhbold, Prime Minister J.Erdenebat and Minister of Foreign Affairs Ts.Munkh-Orgil were present at the ceremony. President Ts.Elbegdorj greeted the diplomats on behalf of the Prime Minister and the Speaker, and said, "We are pleased to see you at this traditional ceremony after a long and cold winter". "Mongolia's external relations and internal affairs were full of historic events in 2016", the President said. He then recalled important events of 2016 such as the 11th ASEM Summit which was hosted in Ulaanbaatar on July 15-16, signing of Mongolia-Russia-China Economic Corridor Program on the sidelines of Shanghai Cooperation Organization Summit, Mongolia's ratification of Paris Agreement on climate change and General Elections that took place on June 29. He then talked about 2017 which is expected to be a significant year because of the upcoming Presidential Election and an economically challenging year. "Happy Tsagaan Sar", the President wished. On behalf of the foreign diplomatic missions in Mongolia, Ambassador Extraordinary and Plenipotentiary of Kazakhstan to Mongolia Kalybek Koblandin gave remarks. He said, "I am delighted to deliver a speech on behalf of the diplomatic missions. We have gathered here to conclude the year of the Fire Monkey, and welcome that of the Fire Rooster". Then the Ambassador briefly touched upon highlights of the last year including dzud conditions, the General Elections, Mongolia's presence in UN Human Rights Council, the ASEM Summit, Mongolia's active participation in UN peacekeeping missions, Mongolia's ratification of Trade Facilitation Agreement and Ulaanbaatar dialogue - 2016. He also appreciated the expansion of foreign diplomatic missions in Mongolia with the Embassies of Australia, United Arab Emirates and Italy last year, and said, "We hope to welcome representations of Poland, Saudi Arabia and the European Union this year. The international community's interest in Mongolia shows their belief that Mongolia has a bright future". Ulaanbaatar, February 23 (MONTSAME) In commemoration of the 105th anniversary of modern diplomatic service in Mongolia, a Presidential decree was issued to bestow the highest diplomatic titles 'Ambassador Extraordinary and Plenipotentiary' and 'Envoy Extraordinary and Plenipotentiary' to Mongolian diplomats. The ceremony took place on February 22, Wednesday at State House with attendance of President Ts.Elbegdorj who handed over the badges and the certificates. The new Ambassadors are Ts.Munkh-Orgil, Minister of Foreign Affairs, Ts.Tsolmon, former Minister of Defense, R.Altangerel, Ambassador Extraordinary and Plenipotentiary of Mongolia to Canada, S.Odonbaatar, Head of Policy Management Department at the Ministry of Foreign Affairs, L.Orgil, Head of ASEM Preparation Office, N.Nyamjav, O.Dambiinyam, G.Jargalsaikhan and B.Suvd, Advisors to the ASEM Preparation Office and senior diplomat Ya.Dashnyam. The new Envoys are B.Batkhishig, Ambassador of Mongolia to the Republic of Turkey, Ts.Batbayar, Ambassador of Mongolia to Cuba, B.Delgermaa, Ambassador of Mongolia to Russia, Kh.Davaadorj, Ambassador of Mongolia to Belgium, S.Tsoggerel, Ambassador of Mongolia to the Democratic People's Republic of Korea, L.Dugerjav, Ambassador of Mongolia to Bulgaria, former Ambassador D.Idevkhten and senior diplomats Ch.Agvaandamdin and T.Dugeree. The titles were thus given with consideration of the diplomats' participation in realization of foreign policy goals, commitment and dedication to Mongolian foreign affairs field and contribution to hosting of the 11th ASEM Summit in Ulaanbaatar last July. February 21 (UB Post) Foreign Affairs Minister Ts.Munkh-Orgil visited China on February 20 and 21, at the invitation of his Chinese counterpart Wang Yi. During Minister Ts.Munkh-Orgil's meeting with Minister Wang Yi, held on February 20, the pair discussed possible areas for further cooperation between the two countries and exchanged views on global and regional issues. The sides agreed to organize a state visit by Mongolian Prime Minister to China and the second meeting of the Mongolian Parliament and China's National People's Congress cooperative mechanism. They also agreed to host the first meeting of Mongolian and Chinese Cooperative Council on mineral, energy, and infrastructure cooperation as soon as possible. To strengthen the legal and regulatory environment for cooperation between the two countries, the ministers also agreed to establish a new agreement on Mongolian and Chinese border sanitation and to sign a memorandum of cooperation and an agreement on roads and transportation cooperation. Both sides emphasized that the two countries will take measures to increase export on mining products, and beef and mutton from Mongolia to China. Chinese Foreign Affairs Minister noted that China has signed an agreement on Mongolia's route to the sea through Chinese territory. Minister Wang Yi stated that China will support Mongolia through bilateral and multilateral aid channels to overcome economic challenges facing Mongolians and stressed that he hopes Mongolia will maintain its fast growing economic development by dealing with its economic difficulties quickly. He said that China is ready to postpone a date to negotiate the currency swap deal between the two countries. As a part of his visit to China, Minister Ts.Munkh-Orgil met with Vice President of the People's Republic of China Li Yuanchao and China's Commerce Minister Gao Hucheng to discuss legislature and economic cooperation between the two nations. During the meeting, the Chinese Vice President stressed that Mongolian Foreign Affairs Minister's visit is of significant importance to strengthening political mutual trust and expanding cooperation between the two countries. The Mongolian Foreign Affairs Minister highlighted that developing friendly relations with China is a key piece of Mongolia's foreign policy and Mongolia is focusing on developing its comprehensive strategic partnership with China. At the end of their meeting, Minister Ts.Munkh-Orgil invited Vice President Li Yuanchao to pay an official visit to Mongolia at his convenience. During Minister Ts.Munkh-Orgil's meeting with China's Commerce Minister Gao Hucheng, the two pair discussed to speed up the implementation of agreements that have been reached. The agreement specifies to organize a meeting of the Mongolia-China Intergovernmental Commission's working groups, accelerate work on China-Mongolia cross border economic cooperation zone, speed up the implementation of projects funded through Chinese soft loans and non-refundable aids, and to collaborate with the Silk Road Fund and Asian Infrastructure Investment Bank on holding seminars and trainings. Minister Hucheng stated that China is ready to collaborate with Mongolia to boost mutual economic and financial cooperation during challenging economic times. February 23 (gogo.mn) Who would be the 45th president of the United States? Will relations between Russia and Amerika be restored? These two questions were attracting global attention. Rumours spread for a while that President-elect Donald Trump won the White House with the help of Russia. After the presidential election of the United States, articles with the title "Putin win" have published in Russian and American press. The Central Intelligence Agency (CIA) has concluded that Russia intervened in the 2016 election to help Donald Trump win the presidency, rather than just to undermine confidence in the U.S. electoral system, the Washington Post reported. The situation has sharpened the Washington`s concerns about Russia. CIA experts considered that cyber attacks carried out by Russian hackers during U.S. presidential election were significantly different from older intelligence methods, which witnessed success of the Russian intelligence services. Moreover intelligence agencies have concluded that Vladimir Putin ordered a cyber hacking campaign to help Donald Trump win the US presidential election. In response, Vladimir Putin has criticized the US Democratic party for trying to "blame" Russia for Donald Trump's election victory. The CIA added, Moscow hackers influenced elections of more than 10 countries by the order of Kremlin authorities. For instance, Russian hackers attacked voting system of parliamentary elections that were held in Ukraine and Estonia, supporting political groups that are of favour for Moscow. Moscow might be planning a similar effort to influence upcoming German and French elections, warned CIA. DOES MONGOLIA HAVE LEGAL ENVIRONMENT TO PROTECT FROM CYBER ATTACK? External factors might affect Mongolian parliamentary and presidential elections, as there is no guarantee. Cyber attack from our neighboring countries and every corner of the world is knocking on our door each hour and day. ​Mongolia adopted its National Security Concept and National Program to Provide Information Security in 2010. However implementation period of National Program to Provide Information Security ended in 2015. Moreover the country is facing lack of professional audit research company that allows us to find out the information security vulnerabilities. If the number of audit research company increases and government supports them under policies, national security will be strengthened. In addition, it is possible for Mongolia to respond to cyber attack as developing countries. CIKARANG, Bekasi, February 22 -- President University hosted the Embassy of Mongolia in their second visit to the campus on Thursday (16/2) with the theme "Mongolia-Indonesia Relations: Public Diplomacy and Closer Cooperation in Millennium". Her Excellency Shagdar Battsetseg, Mongolia's Ambassador Extraordinary & Plenipotentiary to the Republic of Indonesia and ASEAN and her team attended the event that was being held in Charles Himawan Auditorium, President University, Kota Jababeka, Cikarang. Opening the visit and Mongolia Open Day in President University, Her Excellency Shagdar Battsetseg delivered a speech about the general overview of Mongolia and Indonesia partnerships. She explained about the brief history of the two countries' bilateral relations in 60 years. Following her remarks, Protocol Officer G. Tumurkhuu outlined the Mongolian education system in his presentation. According to him, there was no systematized education until Mongolian's revolution in 1921. He also added that the first university in Mongolia was built in 1942 and ever since, Mongolian education system keeps developing up until now. Moving forward, Technicians O. Khulan continued the event by describing Mongolia's environment and foods with amazing photos and videos. Furthermore, Her Excellency Shagdar Battsetseg continued to explain the cultural differences between Mongolians and Indonesians. In her opinion, Indonesians possess soft characters meanwhile Mongolians got an ambitious character. "Mongolians have the spirit and a way of living that was passed down from the Genghis Khan," she said. However, though with the cultural differences, Mongolia and Indonesia have sucessfully maintain a good relationship without any conflict. One of the good relationships amongst the two countries also takes place in President University, where one of the Mongolians, Zorigt Tugsjargal, is currently pursuing his higher education. He is the first Mongolian student who learns in President University. "As the first Mongolian student here in President University, I will be the bridge between Mongolia and Indonesia", said Zorigt in his speech. Dr. Handa S. Abidin, Vice Rector for Partnerships in President University, also added that the partnership with the Embassy of Mongolia is one of the ways to welcome more students from Mongolia to study in President University. MACON, February 23 – Mercer University's Department of International and Global Studies (IGS) began hosting former U.S. Ambassador to Mongolia Dr. Jonathan Addleton as a visiting professor this spring. Dr. Addleton is teaching a section of the department's "Introduction to International Relations" course, which is a requirement for students with political science and international affairs majors. "The International and Global Studies Department is both honored and excited to host someone with Ambassador Jonathan Addleton's varied and valuable experiences in the U.S. foreign service," said Dr. Eimad Houry, professor and chair of international and global studies. "Dr. Addleton has agreed to teach one or two courses a term and to share his expertise, contacts and insights with students who are pursuing career interests in the international arena. We look forward to the new possibilities that Dr. Addleton will bring to IGS programs, like international affairs and global development studies, and the College of Liberal Arts." Born and raised in Pakistan, the son of Baptist missionaries from Macon, Dr. Addleton is a career foreign service officer with the rank of career minister. He retired in January following more than 30 years of service as U.S. Ambassador to Mongolia; senior civilian representative for Southern Afghanistan based in Kandahar; development counselor at the U.S. Mission to the European Union in Brussels; U.S. Agency for International Development (USAID) mission director in India, Pakistan, Cambodia and the Central Asian Republics; and USAID program officer in Jordan, Yemen and South Africa. "Given my longtime family ties to Macon, it is an honor to have this unexpected opportunity to teach at Mercer University, and hopefully also to help further strengthen its international connections," said Dr. Addleton. Prior to becoming a foreign service officer in 1984, he worked briefly at the World Bank, Carnegie Endowment for International Peace and The Telegraph in Macon. He has also served on international school boards in Amman, Jordan; Ulaanbaatar, Mongolia; and Phnom Penh, Cambodia. His experiences in Afghanistan inspired his memoir, The Dust of Kandahar: A Diplomat Among Warriors in Afghanistan, which was published in 2016. He has written three other books, Mongolia and the United States: A Diplomatic History, Some Far and Distant Place and Undermining the Center: The Gulf Migration and Pakistan, and contributed articles to publications such as al-Mushir, Ambassadors Review, Asian Affairs, Asian Survey, Fletcher Forum, Foreign Service Journal, Mongolica, International Migration, Muslim World and The Washington Post. Dr. Addleton was recently interviewed by Public Radio International (PRI) on the topic of growing dissent in the U.S. State Department in response to President Donald Trump's executive order to ban refugees and immigrants from several majority Muslim countries. MERIDEN, Conn., Feb. 22, 2017 /PRNewswire/ -- Protein Sciences Corporation, a leading vaccine development company and maker of Flublok® Influenza Vaccine, announced today that they donated 45,000 doses of Flublok to The Partnership for Influenza Vaccine Introduction (PIVI) and the Mongolian Ministry of Health to help protect communities from the devastating impacts of the flu. The doses of Flublok have been distributed and used in all regions of Mongolia for health care workers, pregnant women, and those from the general public that come to participating clinics during the influenza vaccine campaign. The government of Mongolia is committed to developing an expanded, sustainable seasonal influenza program. PIVI and Protein Sciences Corporation, through the Flublok donation, are providing key support to Mongolia to achieve this vision. Flublok is a breakthrough in how flu vaccines are manufactured: it is the only flu vaccine that is an exact match to circulating flu strains, and it has been shown to protect broadly against the flu. In addition, it is the only flu vaccine made without ingredients that have been found objectionable in traditional flu vaccines. PIVI agreed that Flublok was a good choice for this program because of the urgent need for flu vaccines in Mongolia and the quality of the Flublok product. "Flublok can save lives," said Manon Cox, President and CEO of Protein Sciences. "When PIVI approached us, we immediately thought it was a perfect opportunity to provide access to Flublok outside the U.S. It is our hope that this donation will not only help protect the people of Mongolia from the flu, but will also assist them in creating a lasting flu vaccination program." "Given the value of a functional seasonal influenza program for pandemic preparedness, PIVI is pleased to partner with Protein Sciences and utilize Flublok in the current vaccination campaign in Mongolia," shared Dr. Mark McKinlay, Director of the Center for Vaccine Equity at the Task Force for Global Health. "Sustainable seasonal influenza vaccine programs are an important building block in the creation of health systems that can not only protect people from influenza now, but also help the country respond to a future pandemic. Flublok is an important new partner to PIVI because this vaccine is not made using eggs, and can be manufactured more quickly than others because it is not dependent on an egg supply." As part of the vaccination campaign, health care workers will be trained in administering the vaccine and will be provided all of the proper immunization information in their local language. Once the campaign is complete, the partners will work together to develop and conduct post-campaign evaluation protocols that will provide data to improve vaccination services in future years. Ulaanbaatar, February 23 (MONTSAME) On February 21, "TSE" Company of the Czech Republic handed over an incubator to the infants' department of the Central Nursing Center for Children of Mongolia. The Center provides specialized medical assistance for infants and children across the country. In particular, the center serves the health needs of twins aged 0-3 of families included in the vulnerable group, half and full orphans, undernourished children or children with iron deficiency underweight or premature baby and abandoned children for 24 hours. The event to present the incubator was attended by D.Zumberelkham Ambassador Extraordinary and Plenipotentiary of Mongolia to Czech and Milan Klechka, President of the Czech-East Asian Chamber of Commerce and other officials. Ulaanbaatar, February 22 (MONTSAME) On February 20, Mongolian Academy of Sciences conducted an election to choose the directors of its affiliated institutes. In particular, new directors were chosen to lead some of the institutes, and old directors were re-elected in some of the institutes. Institute of Philosophy will be led by Sc.D Sh.Ariunaa, Institute of Language and Literature by Dr G.Bilguudei, Institute of Geography and Geoecology by Dr D.Battogtokh and Institute of Chemistry and Chemical Technology by Dr L.Jargalsaikhan. Also, Sc.D J.Baysakh was re-elected to head Institute of International Relations, Sc.D Ya.Adiya Institute of General and Experimental Biology, Dr Kh.Tsogtbaatar Institute of Paleontology and Geology, Dr S.Chuluun Institute of History and Archaeology and Dr S.Demberel Institute of Astronomy and Geophysics. Following an election which took place in December, Dr P.Altantsog is currently working as a Director of Institute of Physics and Technology. Mongolian Academy of Sciences was established in 1961, and 10 scientific institutes and 2 specialized academies are operating under the academy. February 24 (Sydney Morning Herald) A scholarship program at RMIT University in Melbourne is providing rare opportunities for Mongolian photojournalists to hone their craft in Australia. The independent journalism community in Mongolia is small – the Press Council of Mongolia, the country's first independent media council, was established only in January last year – but it is vibrant and growing. "Pre-independence in 1990, Mongolia had three official government sanctioned media outlets. In 2017 there is thirst for news and media outlets and newspapers continue to provide a healthy rate of employment for photographers. This is in direct contrast to the western world, where employment through newspapers is in decline," Jerry Galea, photojournalist fellow at RMIT told Fairfax Media. The scholarship winner for 2016, Mongolian photojournalist Davaanyam Delgerjargal, spoke to Fairfax Media. "One of the issues that interests me is that though Mongolia is a beautiful country, I see Mongolians are moving from traditional culture, and the changes are coming very quick, technology brings a lot of changes ... that's what I want to catch in my photos. It's these challenging issues that I want to capture in my photos." Davaanyam is a member of Mongolia's Batzorig Foundation of Documentary Photography and teaches photography at the Radio TV Institute, one of the few educational organisations where photography is taught in Mongolia. "Unfortunately there are only few professional documentary photographers [in Mongolia]. Media reportage is underdeveloped here, our media organisations broadcast everyday events. But it is limited and is is reporting the difficult issues ... the professional skills here are relatively low, we lack the practice of international journalistic standards," Delgerjargal said. Galea, who is researching a PhD on the role of documentary photography in Mongolian society, said the RMIT program buttressed the country's independent media voices. "Our program sees a gap in knowledge among Mongolian photojournalists and the scholarship is the first step to help visual understanding amongst Mongolia photojournalism community," Galea said. As part of the program Delgerjargal will spend four weeks of workshops based at RMIT and at Melbourne's Magnet Gallery, which is a partner and supporter of the program. February 24 (ABC) As far as she knows, accounting student Alima is the only Mongolian in Darwin right now. "Just me," she smiled as she sat among the shelves in the bright and sunny Charles Darwin University library. That is, apart from Alima's husband, who has followed her from their home in northern China to the Northern Territory's Top End where she is embarking on her second masters degree. Alima is here to hone her financial management skills, which she plans to use in the food distribution business — dried beef and dairy — that she helps run back in Inner Mongolia. "I want to go higher with my position, and maybe someday I want to build my own business." She is one of 36 young people from countries across Asia who have picked up a first-of-its-kind scholarship funded by the NT Government. They were officially welcomed at a reception at Parliament House this week, where a beaming Chief Minister Michael Gunner thanked them "for choosing the Territory". If all goes according to the Government's plan, there will be more and more international students doing just that over the next 10 years. The new scholarships are part of a concerted effort, started under the previous CLP administration, to grow the Territory's international education sector and carve out a greater share of what has become the country's third largest export after iron ore and coal. A 2014 brochure describing the 10-year international student sector strategy emphasised the benefits to students of living and learning in the Top End. But it also focused heavily on the benefits the students could bring to the local economy and industry in the form of partnerships and trade links with their home countries. "To the south there are around 23 million potential consumers of NT products; to the north (within the same distance) over 300 million, with a faster growing wealth base," the strategy reads. "Having an Asian capable workforce, able to do business in the region, is essential to the NT's future." Student numbers growing – but is it enough? Figures released this week by the federal education department show the Territory's international student numbers grew by 9.3 per cent last year to 2,026. The growth rate is better than some places but dwarfed by others; there are more than 200,000 international students in New South Wales, almost as many in Victoria, 28,000 in South Australia and more than 5,000 in Tasmania. The task for the Territory is to convince prospective students to look no further south than Darwin. Alima said she researched Charles Darwin University based on a friend's recommendation and found the tuition fees to be slightly more affordable than those in the southern states. As an enterprising young businesswoman marketing food products to Asia's growing middle class, she is likely find some new friends in the Territory's hungry agricultural export community. She said she was open to making business connections during her time studying in Darwin but was also here to grow as a person. "The difference and comparison is kind of exciting for me and makes me really want to look [at] other ways of thinking, ways of communicating and ways of maybe eating," she said. "It makes me want to see more about the world." Participants will work and interact with professional groups who are re-envisioning how to use social work interactions to treat clients, while filming on-site experiences. Participants can expect to complete readings about social welfare service delivery in Mongolia and identify a specific project, completed both in Utah and Mongolia. While in Utah, students will conduct literature searches and provide a brief summary about the designated project. February 23 (gogo.mn) Can`t decide what to do during Tsagaan Sar? We at GoGo Mongolia, offering you events to be held during Tsagaan Sar in Mongolia. This year the first day of Tsagaan Sar occurs on Feb 27th and the first three days of Tsagaan Sar (Feb 27-Mar 1) is non-working public holiday nationwide. So don't just hide at home during Tsagaan Sar – come out and celebrate this beautiful age-old celebration and experience the Mongol culture, hospitality and traditions with following events. Mongolian Secret History camp is organising an annual event during the Tsagaan Sar to give expats and visitors alike the opportunity to experience this beautiful celebration just like locals. The event will be held on February 26-27th. For more info on the event program and tax, please click HERE. Or contact the organisers at: Phone: 976-11-70000450, 99043547, 99993200. Genco Tour Bureau tourism centre invites you to take part in their Lunar New Year First Sunrise tour on February 27th (the First day of Tsagaan Sar) and whisper your wish to make come true. The tour will take place at the Chinggis Khan statue complex, Tsonjinboldog - about 1.5hr drive from Ulaanbaatar to the east. There will be a sunrise ceremony, breakfast, calligraphy and traditional music performance. Adventure Temple offers you a cozy evening with a good film "The Eagle Huntress" directed by Otto Bell on Mar 3rd. Mongolian Photographer`s Association is organizing Nomad event on March 4th at Ugtaaltsaidam soum, Tuv aimag which locates 140 km away from Ulaanbaatar city. The event enables you to visit herder family, attend Nomad and Horseman competition, eat lunch outside near fire and take photos. Also horse riding is available for 20,000 MNT. Event tax is 50,000 MNT (including transportation, lunch, dinner and other performances). Blue Pearl International Ice Festival 2017 will take place at Khatgal village, the southern shore of lake Khuvsgul on Mar 3-4th or the fifth and sixth day of Tsagaan Sar, enabling you to experience Tsagaan Sar celebration visiting a nomad family. The event offers traditional horse sled races, reindeer races, skating competitions, and shamanic rituals. Also, there will be an Ice Sculpture Competition – artists will create a winter fairyland on the 2-3m thick, crystal clear ice of the Lake Huvsgul, and various performances by the locals and artists of the local theatre. The Federation of Mongolian Horse Racing Sport and Trainers is organizing the annual regional spring horse races "Dunjingarav 2017" on Mar 5th. The horse races will feature both Mongolian breed and mixed breed horses during the 2 day event at Argalant soum, Tuv aimag. It's an event not to be missed as one can experience the Mongolian horse culture in depth and take a little break in the steppes (free of charge). Just after the Tsagaan Sar celebration, the Eagle Festival is announced to be held on Mar 5th, 2017 at the Chinggisiin Khuree tourism camp, located in the Bogd Khan National Park. Real eagle hunters with their mighty Eagles will come all the way from Bayan-Ulgii to compete including the famous Aisholpan – actress of "The Eagle Huntress" (2016) documentary directed by Otto Bell. It is the event for those who can't travel over 1300 km to the westernmost Mongolia to see the Eagle Festivals that take place in September (Altai Eagle Festival) and October (Golden Eagle Festival) in Bayan-Ulgii province. The date of the Camel Festival 2017 is 6-7 March and the event will take place in Bulgan soum of Umnugobi aimag. It's an entertaining 2-days of event that features various contests related to Mongolian camel culture and lots of local music and dances. Nomads from far and near wear their best deels, the traditional costume of Mongolia and ride their best camels to attend the festival as it's their pride and a big celebration for them. February 23 (gogo.mn) Our report team have visited wintering place of one of the State's Best Herder, D.Ganbat. D.Ganbat received his State's Best Herder certificate from the Minister of Food, Agriculture and Light Industry P.Sergelen this week. His wintering place is located in Esunzuil soum, Uvurkhangai aimag. February 22 (gogo.mn) "Tsagaan Sar" celebration is the Lunar New Year for the Mongols according to their centuries old lunar astrology. The Mongols celebrate Tsagaan Sar since the Great Mongol Empire for passing the harsh winter in good health and is considered as the beginning of spring. Moreover the Tsagaan Sar is a big family celebration as everyone gather at their elders, grandparents or parents home to greet and wish well for the coming year. The date of the celebration is determined according to lunar calendar. This year the first day of Tsagaan Sar occurs on Feb 27th and the first 3 days of Tsagaan Sar (Feb 27-Mar 1) is non-working public holiday nationwide. In the city the first 3 days of Tsagaan Sar is a holiday, though it extends as long as 15 days for nomads in the countryside, and after Day 15 the new year is no longer new, and everyone stops visits and festivities and goes back to the normal, ever busy lifestyle. Families, especially women prepare for Tsagaan Sar celebration at least one month prior by cleaning houses, yards, gers to meet the New Year fresh as well as making hundreds to thousands of buuz, a type of Mongolian steamed dumpling filled with meat. Although urbanization is taking place rapidly, Mongolians still manage to keep their traditions and customs within the city boundaries. Mongolians have tradition to greet the new year with big feast table symbolizing prosperity and success in the coming year. The table should be ready on Tsagaan Sar Eve (Bituun). In the evening of Bituun, families gather together and one needs "to eat to repletion" or to have enough food which symbolizes plenty of food and full belly in the coming New Year. It is believed that staying hungry on this day will prophet hunger for the whole state so that every one makes sure that one has eaten. It is the only festival that you can taste or try almost all of traditional cuisines at every family you visit. Main foods on the Tsagaan sar table are uuts (lamb loin), cookie set plate and buuz while main drinks are milk tea, airag (mare`s milk), seabuckthorn juice and alcohol beverages. Also the feast table is usually accompanied with the appetizers, salad plates, candies and dairy products. Every families first offer milk tea and dairy products to their visitor and then buuz. Also all guests must taste the uuts (lamb loin) and cookie set plate. In other words, the more you visit, the more you will eat. If the total animal fat we should consume comprises 30% of our total supplement intake, while our one day of Tsagaan Sar food intake provides 60% of animal fat. You might wonder that what to do with the foods on the table after the Tsagaan Sar. Elders share the lamb loin and cookie set plate with their children and relatives. In the first morning of Tsagaan Sar people get up before sunrise, put on their new or clean deel, the traditional costume of Mongolia and walk in directions prescribed by the zodiac to start of the new year in right direction. This is thought to bring good luck for the coming year. Then men climb to the nearest mountain to watch the first sunrise of the New Year. Women make milk tea and offer it to earth and god for the best wishes. With the sunrise, the greeting ceremony starts in order of age: the eldest or hosts of the family sit at khoimor (opposite side of door, the most sacred areas of the home). People greet each other in a unique way. The younger people vow to the elderly and cross their hands under the hands of the older people supporting their elbow and say: AMAR BAINA UU meaning how are you. Then the older family member kisses the other on the both cheeks. Sometimes they greet with an offer of "Hadag", a blue scarf as token of respect. Also it is common to greet the elders with money. Thereafter, the guests have a seat and exchange snuff-bottles in greeting and say: have you got through the winter in plenty and seeing at spring well. With these traditional New Year greetings they encourage each other. Younger person starts the greeting with snuff-bottle by loosening the cap of the bottle by turning it to right three times and snuffing it first and offer it to elder person with right hand. In return elder person gets own snuff-bottle loosens the cap as well and exchange. Then the family you visit give presents to you, thanking for your visit. You must remember to avoid greeting elders and relatives or going to other household on seventh day of New Year, as this year is considered as black day. 1. To get water from springs or rivers. Water buckets should be filled beforehand. 2. To sew old clothes. Only sewing of new garments are welcomed and seen as good wishing for New Year. 3. To borrow and lend. 4. To cry and quarrel. It is believed that whole year will be bad with disputes. 5. To throw away ash from stove. Cleaning should be done on Bituun. 6. To say bad words, to hunt, to kill animal. 7. To greet elders and relatives, to go to other household on seventh day of New Year, as this year is considered as black day. 8. To greet one's husband or wife. Doing so might end in split and become enemies. 9. To overdrink and be disrespectful at the feast table. 10. To carry knife. This means that someone came with bad intentions. ​Technically that is how we celebrate Tsagaan Sar in Mongolia. It is definitely the festival not to be missed if one wants to really get to know Mongolian culture. Tsagaan Sar is not only a festival, it is a cultural heritage of Mongolians, more than just greeting, meeting and eating together. Tsagaan Sar gives an opportunity to gather all the family members to strengthen their ties and relationship, which is not observed in many other countries. February 23 (gogo.mn) WHAT IS A BUUZ? Buuz is a type of Mongolian steamed dumpling filled with meat. The dish is traditionally served on most public winter holidays including Tsagaan Sar and New Year Celebration. Buuz is prepared in weeks before and left outside to freeze for a while to make it easier to store. A household who has elder has to make more than one thousand buuz for their guests, while younger families make more than three hundred buuz during the Tsagaan Sar. It is also offered at all restaurants and small cafes in Ulaanbaatar. Ingredient of buuz is very simple it includes flour, meat, onion, salt, cumin and warm water. Mix together the flour, salt and water in a medium sized bowl. Left it to rest for 15 minutes. Combine all ingredients in a bowl and mix until everything is well combined. Add some water, if required, to make the filling a little juicy. PS: The dough can be filled with anything from savory meats to vegetables, cheese, fruits or even seafood. Here goes the most interesting yet difficult part of making buuz. 1. Cut the dough into 2 cm (1 inch) thick slices and roll the slices into circles and lightly dust with flour to avoid them sticking to each other. Make the center slightly thicker than the edge. 2. Place one tea spoon of meat filling in the center of the circle and seal or pinch the edges with your fingers. There are many styles for pinching or sealing the buuz and below is the video which will help you to find out the perfect pinch for you. Finally, Mongolians say bon appetite as SAIHAN HOOLLOOROI. February 22 (MONTSAME) Mongolians use over seventy types of traditionally made dairy products generally named as "Tsagaan Idee" in Mongolia. Since the time immemorial, Mongolians have been making dairy products and history shows that two thousand years ago, the Huns enjoyed an extensive range of dairy products, such as airag and aaruul. The first Mongolian dairy producing factory was established in 1958, which is today's Suu JSC. It has created the largest milk processing network by working collaboratively with over 2500 herders and farmers to meet the constantly increasing demand of the consumers. The company has consistently brought in the world-class modern technologies and formed a fully automated modern factory with ISO 9001:2008 quality management system. Instead of its certain products, the name 'Suu' JSC (Suu means milk in Mongolian) itself became a brand in Mongolia. Their products are distinctive with their natural taste compared to the imported milks with 'mixtures' or other milk products that are manufactured in various technologies. Every country runs tests and experiments using various chemicals or use Tetra Pak packaging solutions to extend the shelf-life of milk products. As for Suu JSC, the milks are packed in eco-friendly cardboards and spoils within three days. Under the slogan "From herder's farm to your home", the company has a daily capacity of processing 200 tons of milk and manufactures about 70 types of products as of now. Ulaanbaatar, February 23 (MONTSAME) Applique or silk art is a Mongolian unique art form of invaluable creativity made alive by meticulous handcraft and incredible conception. Only four of such astonishing painting exists in Mongolia and one of them is being preserved at a museum in Zuunmod soum of Tuv aimag. This distinctive 130cm x 257cm sized appliqué has been stored for many years and is being made public as the name "Ganzai". B.Sukhbaatar, the head of the museum said "The quilted craft that was found from the tomb of a Hun is considered the first artifact of appliqué. This remarkable form of art has been prospering for thousands of years and is proven to be a unique cultural heritage of Mongolia. Ornamental art of this elegant appliqué differs from a painting as it is made by weaving different colors of silk and ornamenting precious stones and mostly represents admiration and respect. On the other hand, the maker puts a lot of hard work and patience as the material choices and process takes a lot of time and requires meticulous effort". The appliqués that are registered in the unique cultural heritages such as 12m x 2m sized "Dunshig's 35 gods" and 2m x 80cm sized "Duinkhor's khot mandal" are also being preserved at the 'Applique' hall of the museum in Tuv aimag. Ulaanbaatar, February 22 (MONTSAME) "Collection of Darkhad songs" book has been released by Office of National Council on Language policy to introduce different dialects of local regions and areas, to inherit culture to next generation. "- When I met with people, who lives on the shore of Khuvsgul lake in 2016 during the parliamentary election campaign, I realized that they are holding 700-800 years old cultural heritage, language and dialect of our ancestors and it motivated me to publish a book collecting Darkhad people's songs. It is pity that cultural immune of Mongolians and characteristics to be distinguished from others are weakening. Mother language and culture are chances to survive as Mongolians. Therefore to make contribution in adoring and inheriting mother language and culture, which is a guarantee of independence, we released this book" said P.Tsagaan, former chairman of the President's office. Folk songs of Darkhad people, different versions of the same songs, origins of songs, Mongolian and foreign scholars' works, recordings, hand writings, reports of studies and researches were used with permission to prepare the book. The collection book contains 825 songs of Darkhad people with its varieties as well as special vocabulary description and names of local areas, rivers and lakes, which included in the songs. Further songs collection of other ethnic groups including buriad, uriankhai and khodgoid will be released. February 22 (news.mn) 'Old Mongolian History', a comprehensive five-volume work about Mongolian history before Chinggis Khaan, has just been printed. The set of books has been published by the Presidential Office in cooperation with the Ministry of Education, Culture, Science and Sports and the National Committee of Mongolian Studies. The 'Old Mongolian History' project was initiated by Ts.Elbegdorj, President of Mongolia. February 22 (news.mn) The Institute of Paleontology and Geology had been deprived of its home building. The loss of the facility is a result of Prosecutor Department Resolution 270, which was subsequently approved by the Mongolian Parliament. As a response, the now 'homeless' specialists, supported by colleagues from other fields of research have established a temporary committee under the Mongolian Academy of Science entitled: 'Let's Save Science!' On 16th of February, the committee submitted a demand to the Prime Minister to annul Resolution 270. So far, however, the Prime Minister has not responded. The latest development is that 'Let's Save Science!' has a announced that the Union of Mongolian Science Organisations will demonstrate on 23rd of February in protest of the loss of the Institute's building. Fossils of dinosaurs will go on parade during the demonstration, said the organisers. LAKE PLACID, February 23 (Lake Placid News) - For Tsermaa Dalai, her advantage has always been language. It's been such a driving force in her life that the native Mongolian has lived a life inspired by a native phrase, "If you have language, you have lakes." "It means you can go far," she said, sipping tea at her home in Lake Placid. Dalai has had quite the journey from her childhood growing up part of a family of nomadic herders in Mongolia's Arkhangai province to working as a translator all over the world. For a woman born in 1973 in a Mongolia under the control of the Soviet Union, Dalai's coming-to-America story, one that started out as just another school girl in a rural Mongolian province on the northern slopes of the Khangai Mountains, is an inspiring one. And the key, the constant, she said, has always been language. An inquisitive young girl, Dalai remembers her youth as one where she was always striving to think independently, despite the systematic control instilled at every level in the Soviet satellite state. In school, she remembers getting herself into trouble many times because she liked to ask questions. But it was her inquisitiveness that would soon open up the world for her. As part of routine Mongolian studies, every child had to learn Russian, a language much different than that the natives spoke. Dalai excelled, and as she grew older in the 1980s, she began to read the magazine "Sputnik," the Soviet equivalent to Reader's Digest. "It was then that I really began to learn," Dalai said, "because a lot of people in my time thought we were the only humans on Earth. "I was very curious," she continued, "I can remember telling my friends that, and soon my Russian teacher, because I loved language, she gave me my first English alphabet. She wrote down my name, my mom, dad - very simple basics at first. And then one of my uncles who was a math teacher, one of very few educated people in the family, he brought me from a conference the cutest little dictionary, English-to-Russian." Dalai realized she could learn the new language from the gifted dictionary. And it was around that time she remembered the English word "love" first came to Mongolia. But the natives would pronounce it incorrectly, with an added emphasis of an "eh" at the end of the word - "Lov-eh." Thanks to her studies, Dalai corrected her friends on how to pronounce the word. And language opened up much more than communication and understanding. Around the age of 17, after the Soviet state collapsed, Dalai continued her language studies. Her growth and burgeoning knowledge soon dovetailed into her own styles, including clothing. It also gave her confidence, as she would debate with the monks in Mongolian monasteries that were able to sprout right up after the Soviet state fell. Dalai would eventually find herself in the nation's capital of Ulaanbaatar, where she studied at the European Language Institute. Her knowledge of communication still growing, it was around this time in the mid-1990s that Dalai and some friends met Americans for the first time in, of all places, Dalai's hometown of Arkhangai. Because she was so well-versed in languages, Dalai's friends asked her to knock on the door of an elderly American couple. She did, and her frightened friends immediately hiding in the bushes. But the American couple was welcoming and handed Dalai a "Who Is Jesus?" booklet. The moment changed Dalai's life. "I read that pamphlet and wept," she said. "On my knees, I prayed. I found what I was looking for all my life. I found my answer in the Bible." Afterward, the American couple approached Dalai's parents and asked them if they could pay for her college in Ulaanbaatar. The opportunity led to the well-versed Dalai working as an interpreter and customer relations professional at a Christian television station that broadcast through Mongolia. Then in 1997, a year after graduating college, Dalai gave birth to her daughter, Evella. As a skilled interpreter, Dalai was a rare commodity in a newly democratic Mongolia, and it was her professional skills that allowed for her and Evella to travel the world, living in Hungary and Denmark at different times. Tsermaa and Evella travelled with one more member of their family, Esteer, a homeless girl Tsermaa adopted while still living in Mongolia. Evella and Esteer went to Hungarian schools while Tsermaa lived and worked in Budapest. Located in Europe, the family was afforded the opportunity to learn more via travels to Germany, Austria, Switzerland, Denmark and Israel. Then, Tsermaa returned to Mongolia, where she was hired on the spot by an American journalist, to translate. From there on out, she always had calls coming in for freelance work. Tsermaa moved to the United States in 2004 after she met and married a man from Keene, New York, who had visited Mongolia. Evella started first grade at Keene Central School, where she would eventually graduate. Four years ago, Tsermaa and Evella decided to move on with their lives outside of Keene. Now Tsermaa works as a freelance health care provider and lives with Evella in Lake Placid. These days, Tsermaa's next dream on her journey is to open her own small business specializing in clothing styles. Named Heluna, it's in honor of her first daughter, who died at just one year old two decades ago. The Mongolian word means, "like a wild horse." For now, Tsermaa is happy in Lake Placid. When she first moved to the Adirondacks, she and Evella felt the trees were too claustrophobic, a stark contrast from the open elevated plateaus of their home in Mongolia. Tsermaa loves her daily walks around Mirror Lake, enjoys snowshoeing up mountains such as Cascade, and enjoys the friends she's made here in this village, including some immigrants like herself. And when she and Evella need a reminder of Mongolia, it's not too far of a drive to Marcy Field in Keene, where they can run through the field like home. "When we first came here, we would have the car stop, and I'd run barefoot in the grass," Evella said with laugh. "I still have to sometimes." February 21 (UNICEF Blog) Extreme weather events are becoming more intense and more frequent in many regions of the world. From increasing precipitation and cyclones in high latitudes and tropical regions, to intensifying droughts in southern Africa, this trend is likely to continue throughout the 21st century. Weather shocks can have long-lasting effects on children's health and education. Hence, these shocks can reduce countries' levels of education and economic growth in the long term. Poor people in developing regions of the world often bear the highest costs of these events. This is mainly due to limited social protection and insurance against weather risks, combined with lack of economic opportunities. Most studies on the impact of extreme weather events focus on droughts or rainfall shocks in tropical or dry regions. However, cold shocks in the form of extremely harsh winters can also be damaging for children. While affecting all regions with continental climate and large seasonal variations in temperature, such as Russia, inland China or the Himalayas, these shocks are especially relevant in Mongolia. Over the past two decades, Mongolia has been hit by two extremely severe winters, which caused mass livestock mortality. The phenomenon of harsh winters causing mass livestock mortality is referred to as dzud in Mongolian language. Extreme winters are characterized by exceptionally cold temperature, excessive snow, lack of precipitation during the previous summer and fluctuations in temperature that cause the snow to melt and then ice over, thus hindering animal grazing. The two recent dzud events can be seen in Figure 1, which shows livestock development in Mongolia over the period 1991-2011. The first event spanned three consecutive winters during the period 1999-2002, while the second occurred in the single winter of 2009/10. Both shocks dramatically threatened livelihoods among the Mongolian population. Indeed, for about a third of Mongolians, animals represent the primary source of nutrition and income. Many herders lost a substantial portion of their herd during the dzud disasters, often falling into situations of food insecurity and poverty. Two recent papers studied the consequences of extreme winters on children's health and education, respectively. As it is often the case when extreme weather hits, the studies found that children were severely affected by the weather shocks. This calls for special attention from UNICEF, which can play a leading role in supporting government policies and programmes to protect children before other extreme weather events occur. The first paper specifically studied the impact of the 2009/10 dzud on the health of children younger than 7 years old, as measured by the height-for-age indicator. Results show that children who were born or in utero during the 2009/10 catastrophic winter and lived in districts that were severely hit by the shock have significantly worse health, compared to same-age children living in less affected districts. The second paper examines the impact of extreme weather events on education. The study finds that individuals who were of school age during the shock and lived in severely affected districts were significantly less likely to have completed mandatory education, compared to peers in less affected districts. The effects are verified for both the 1999-2002 and the 2009/2010 winters. They are also large in magnitude and persist in the long term, up to about ten years after the shock. This is particularly striking in a middle-income country like Mongolia, where there are no tuition fees for basic education. In both studies, the effects only hit children from households that were engaged in herding before the shock. Moreover, the data show a negative correlation between shock intensity and post-shock household income. Taken together, the results suggest that it is not winter conditions, per se, to which all children are exposed, which drive the results. Actually, it appears that weather shocks affected children mainly through losses in household assets and income. What can UNICEF do to protect children from extreme weather shocks? The fact that children were not shielded from the negative consequences of the 2009/10 winter disaster shows that the country did not experience sufficient learning from previous weather shocks. Because extreme weather is likely to strike again in Mongolia and elsewhere, it is essential to apply policies which protect vulnerable children in case of future shocks. More research is needed to better understand the long-term effects of weather events and the mechanisms behind them. However, the existing evidence already indicates a range of complementary policies that can mitigate the impact of weather shocks on children. As UNICEF previously advocated, such policies include post-disaster relief, such as the provision of nutritional supplements to infants or pregnant mothers or the delivery of fodder to protect weakened animals. The research presented here indeed finds a positive correlation between the amount of food and fodder aid distributed after the shock and children's health outcomes in a given district. Preventive interventions are equally, if not more important, than post-shock support. In the context of health protection, these may include monitoring the health of pregnant mothers and infants – even in non-disaster years – especially in remote rural areas and in poorer households. Moreover, weather insurance can be effective in protecting household income and, in turn, children's health and education. Increasing the diversification of household economic activity can also improve household resilience in the face of weather extremes. As a form of income support, cash transfers also have great potential as a mitigation policy in the context of natural disasters. Finally, improving the dissemination of information on extreme weather events, for instance through early warning systems, may also prevent the negative consequences of extreme weather on children. Valeria Groppo is Social and Economic Policy Consultant at the UNICEF Office of Research – Innocenti. Thanks to Michelle Mills for her comments. The research presented in this blog was conducted within the project "Economics of Climate Change: Coping with Shocks in Mongolia". The project was carried out by a team of researchers at the German Institute of Economic Research (DIW Berlin), in cooperation with the Mongolian National Statistical Office (NSO). Funding for the project was provided by the German Federal Ministry of Education and Research. Explore the UNICEF Innocenti research catalogue for new publications. Follow UNICEF Innocenti on Twitter and sign up for e-newsletters on any page of the UNICEF Innocenti website. February 23 (People in Need) Extreme winter weather, termed 'dzud', has hit Mongolian herders once again. The phenomenon which appears approximately once in decade has unusually appeared for the second consecutive winter in a row. Seventeen out of twenty-one provinces have officially declared being affected with dzud. The most vulnerable people are now the herders who did not have enough time to recover from the damages from last year. Around 157,000 herders are at risk of losing livestock and their livelihoods, with the lean season expected to last until May. People in Need (PIN) prepares emergency response to those affected in the Dornod, Sukhbaatar and Khentii provinces of East Mongolia. The most vulnerable herders will receive feed for their animals and financial support to cover basic family needs. "My 20 cows have already died. I am doing everything I can to save the rest of my livestock, but animals are still getting weaker and my feed reserve will run out in a few weeks. I don't know what I will do after that," describes the critical situation 43-year-old Urjinsuren Mijiddorj, showing his cows that recently died from weakness and froze in his backyard in Kherlen soum. "I hope the snow will melt soon," he adds. This year's dzud caught even the usually prepared herders by surprise. An absence of cash and exhaustion of all reserves has forced the herders to look for a short-term solution. They are borrowing food and essential goods from shops, getting a bank loan if possible, or selling the animals for very low prices, consequently losing possible income from the cashmere, dairy, and meat. When a herder loses his livelihood, his whole family is threatened because they depend on him. This results in impoverishment of the rural population and undermines their resilience for the upcoming winter. People are not able to cope without help. Steppe fires and dry summer followed by heavy rains in September and early snow in October has put the rural population in an extremely vulnerable position. By February 2017, 77.8% of the country was covered in snow. Thick layers of snow and ice in the mountainous regions, as thick as 50 cm, cover most of the pastures and causing animals' injuries and starvation. These harsh weather conditions and breakouts of deadly infectious diseases have already killed more than 45,000 heads of cattle, leaving more than 8,000 households in need of emergency assistance. "Mongolia did not get over the last dzud yet. Local herders are used to rough winters and always try to carefully prepare themselves and have enough fodder reserves for their herds. But no one expected these bad conditions this year," says Jaroslav Petřík, the PIN coordinator for Mongolia. People in Need, together with the support of the Ministry of Foreign Affairs of Czech Republic, currently prepares support for more than 550 of the most vulnerable herder families in eleven dzud-affected soums of Dornod province. "People here will receive feed kits for animals and unconditional cash grants to cover basic household needs. Our team in Mongolia is ready to provide assistance for 5,000 more people," adds Jaroslav Petřík. Family of the herder Tserevjav Chuluunbaatar seems luckier as they have not lost any animals so far. But despite the fact that their livestock of 32 heads is still alive, it is far from enough for him and his family of five to survive on. That is why Mr. Chuluunbaatar at the age of sixty-one is not only taking care of his own animals, but is also working as an assistant to another herder. "My fodder reserves are running out and we do not have any money to buy more. Your help will be just in time and we are very grateful", says Mr. Chuluunbaatar while showing his newborn sheep. PIN has already helped those affected by dzud in Mongolia in 2010 and 2016. In cooperation with Caritas Czech republic herdsmen families were provided with financial and food assistance, allowing them to resume their agricultural trade and prepare for the next hard winter. Apart from the immediate humanitarian aid, PIN helps herders and local authorities identify long-term measures to better prepare for more frequent dzuds and minimize their consequences. Since 2011, PIN has a permanent country program in Mongolia (read more). PIN provides current aid to dzud-affected Mongolian with the support of the Ministry of Foreign Affairs of Czech Republic, and the support of the Czech public who contributed through Club of Friends of People in Need. People in Need would like to thank all donors for their support. February 22 (news.mn) Horse racing is one of Mongolia's traditional 'three manly games' and a main feature of the Naadam festival in July. It is, however, not just limited to the summer. National and international children's rights organizations have expressed their strong opposition to illegal horse races in winter or early spring, involving small boys as child jockeys. There have been numerous cases of injuries and even fatalities. In response to this pressure, the Government of Mongolia has regulated the horse racing dates and locations. The following horse races will be held in the spring and summer of 2017, in compliance with the law on the National Naadam Festival. "Dunjingarav" spring horse racing of central region at Tsagaan hotol of Argalant soum, Tuv aimag on March 5th, 2017. Regional spring horse racing in Khuvsgul and Gobi-Altai aimags on March 12th, 2017. Ulaanbaatar, February 22 (MONTSAME) - A total of MNT806 million will be spent from the state budget for international sports competitions and games to host in the country. These include championships of Asia and South Asia, international games and competitions of children, youth and adults in sports of chess, free wrestling, boxing, volleyball, badminton, soft tennis and aerobic. Ulaanbaatar, February 23 (MONTSAME) Team of the best judokas of Mongolia left yesterday for Dusseldorf Grand Prix 2017 to commence on February 24 in Dusseldorf, Germany. The Grand Prix is hosted by the International Judo Federation (IJF) and challenging 380 wrestlers, 224 men and 156 women from 52 countries. Representing Mongolia, D.Tumurkhuleg and D.Altansukh (66kg), S.Bayartuvshin (73kg), G.Boldbaatar and D.Amartuvshin (60kg), B.Altansukh and B.Gaajadamba (81kg) and B.Bat-Erdene (90kg) are competing in men's division, and E.Gerelmaa (48kg), Ch.Azzaya (52kg), D.Sumiya and L.Enkhriilen (57kg) are being challenged in women's division. February 23 (MONTSAME) Mongolian athlete B.Achbadrakh won bronze medal in Cross-Country Men 10.0 km Individual Classic Qualification Race in the FIS Nordic World Ski Championships in Lahti, Finland on February 22 to March 05. A total of 67 athletes from 28 countries competed in the 10 km race, which was held on February 22 and B.Achbadrakh finished the race with time of 27:27.0, while finishing time of the gold medal winner Crncovic Kresimir was 26:21.5 and the silver medalist Klicevicius Deividos's was 27:17.1, according to unofficial results. Mongolian athlete B.Amarsanaa took 19th place, also racing in this distance. Four athletes are participating in the world championships, headed by trainer of national selective team J.Khaliun. In women's 10.0 km Individual Classic Qualification Race athlete Ch.Otgontsetseg took 4th and A.Enkhtuul 9th place. February 22 (UB Post) Hasu Cup 2017 volleyball tournament was organized by the Mongolian Volleyball Association and Hasu Megastars Club from February 14 to 19 at Eco Sports Complex. Tenuun-Ogoo team, led by E.Saikhanbaatar, claimed gold medal in the men's match. Tenuun-Ogoo won silver medal in last year's Hasu Cup. Megastars and Erchim teams won silver and bronze medals respectively. Altain Bars team claimed the winner's cup in the women's tournament. They were followed by Enagura and Tenuun-Ogoo teams. A total of 14 volleyball teams (nine men's and five women's) competed in the Hasu Cup 2017. This year's Hasu Cup took place at Eco Sports Complex in Khan-Uul District. During the closing ceremony of the tournament, the best players of the tournament were announced. Tenuun-Ogoo's International Sports Master E.Saikhanbaatar was selected as the best male player and D.Unentuya of Altain Bars became the best female player. February 22 (UB Post) A Mongolian memory team comprised of 19 athletes competed in the first Korea Open Memory Championship, which took place in Seoul from February 17 to 19, and won 41 medals. Mongolian athletes won 14 gold, 15 silver and 12 bronze medals and renewed several world memory records. G.Enkhlen in the spoken numbers category. International Sports Master E.Lkhagvadulam won gold medal and B.Ariunsanaa gained bronze medal in the teenage category overall. B.Khangal and O.Tuvshinzaya each received bronze medals in the junior category. A total of 178 competitors from 12 countries challenged their memory skills in 10 categories: names and faces, binary numbers, five-min images, speed numbers, historic date, random cards, random words, random numbers, spoken numbers, speed cards. February 23 (Driver Magazine) BMW announced the next GS Trophy destination. The 2018 edition takes place in Mongolia in early summer of 2018 and anyone can participate by signing up at the regional qualifiers set to take place this year. After North and South Africa, South and North America and Southeast Asia, the sixth BMW GS Trophy is set to take place in Mongolia - an adventure dream destination for any rider. The competition is open to all non-professional BMW riders. GS Trophy tests riders on their riding, adventure, teamwork skills while and handling of the BMW GS motorcycle is at the core of the skill set. The regional qualifiers held throughout 2017 typically replicate the challenges of the International GS Trophy and are often two or multi-day competitions with riders scoring points, leading to a final where the top scorers will compete for the three team positions. Those lucky – talented – three will then be fully equipped by BMW Motorrad for the adventure ahead, flown to Mongolia and each presented with a brand new personalised BMW GS motorcycle to ride for the duration of the event. 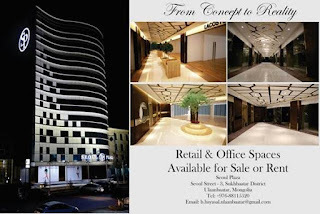 For more information and details of the Intl. GS Trophy 2018 please go to www.gstrophy.com. February 21 (UB Post) From February 17 to March 5, The Best Art Gallery (BAG) of the Union of Mongolian Artists is hosting "Heavenly Horses", a group exhibition by young artists. The exhibition of equestrian art includes over 30 fine arts and sculptures by 10 young artists. A bronze horse statue dating back to the Bronze Age, a curry comb, and a horse-head fiddle are also on display at the exhibition. Equestrian calendars and notes are also featured. Director of BAG S.Chuluunbaatar shared that the central point of the exhibition is to present new fine arts by artists who paint horses to people who love horses on the occasion of the Mongolian Lunar New Year. Director S.Chuluunbaatar said that since the exhibition's opening, he has felt that Mongolians' love and pride for horses as the exhibition has been extremely popular. He said that BAG will annually hold exhibitions and other activities related to equestrian art during Naadam and Lunar New Year. During the exhibition's opening remarks, Member of the Federation of Mongolian Horse Racing Sport and Trainers G.Chinzorig said that the federation will support the artists in organizing more equestrian exhibitions and auctions during Naadam in Ulaanbaatar and provinces this summer. Ulaanbaatar, February 22 (MONTSAME) An exhibition on Mongolian woodcrafting is taking place at 'The Fine Arts Zanabazar Museum' between February 22 and March 22. During the opening ceremony held today, general issues on the preservation of museum objects and exhibits were discussed among the experts and public. According to Kh.Tserenbyamba, a researcher at 'The Fine Arts Zanabazar Museum', the museum holds over 3 thousand exhibits and only the selected hundred Mongolian wooden arts are being displayed on the exhibition. The exhibit consists of household instruments, Khurgan (lamb) ger and religious items of between 17th and 20th centuries and the highlights of the exhibition are the Chariot for the Maitreya Procession, gold-coated wooden saddle and Khurgan ger. The Chariot for the Maitreya Procession was originally destroyed in the 1940's and was reconstructed by the students of the Art Institute of Amsterdam in 2000. The chariot represents the arrival of Maitreya, the future buddha and is considered the beacon of hope in the buddhist tradition. As for the wooden saddle, the item was created in the 17th century and was used by High Saint Zanabazar himself. The saddle has golden plate dragons where the High Saint's herd seal is visible on top of the dragon. Preservation of museum object is relatively poor in Mongolia. Especially, the wooden objects decay or even break in an ever-changing environments. Most objects respond to the moisture in the atmosphere, so the longevity of museum objects depend heavily on the temperature and moisture of the hall. Due to the extreme climate and facility structure, preservation of museum objects is becoming an issue. Therefore, the 'Mongolian Cultural Heritage of Woodcraft' discussion was held in order to help create the guidelines of temperature separation of the facility and other ways to preserve museum objects at affordable cost. February 22 (gogo.mn) Join the tour to watch the first sunrise of the Lunar New Year and whisper your wish to make come true. Genco Tour Bureau tourism centre invites you to take part in their Lunar New Year First Sunrise tour on 27th February (First day of Tsagaan Sar). The tour will take place at the Chinggis Khan statue complex, Tsonjinboldog - about 1.5hr drive from Ulaanbaatar to the east. There will be a sunrise ceremony, breakfast, calligraphy and traditional music performance. Tour route: Bayangol hotel, Ulaanbaatar - Chinggis Khaan Statue Complex - Bayangol hotel, Ulaanbaatar. For more info please contact at: 7012-0202, 9322-9323 or click HERE. Ulaanbaatar, February 23 (MONTSAME) "Khukh Suvd-2017", (Blue Pearl-2017) the XVIII annual international ice festival will take place in Dood Modon Bulan of Hatgal town, Khuvsgul aimag between March 2 and 5. Khuvsgul Lake freezes around November with 1-1.5 meter layer of ice and the ice festival has became a tradition for the natives which is held in March every year. The festival has been taking place since 2000 with an aim to develop Mongolian winter tourism, to extend tourist season, to create income opportunities for the local community and to promote magnificent landscape of Khuvsgul Lake, one of the largest clean water source of Asia. The festival is being organized by the collaboration between the Community of Khuvsgul Tourism, Ministry of Environment and Green Development and the Governor's office of Khuvsgul aimag. The Ice Festival will open up with a parade of skaters, horse and dog sleds, as well as Russian figure skating performance. During the event, horse sled race, introductory bonfire party of shamanist ritual, ice archery, figure skating contest, sumo-wrestling on ice and other fun games will be hosted. The guests are able to visit ice huts, drink cold beverages from a frozen cup, ride horse sleds, skate on the crystallized ice of Khuvsgul Lake and enter the ice sculpturing contest. Also for your entertainment, the glittering ice town will welcome you upon your arrival where you can find reindeers and shaman huts. Inside the town, even the household instruments will be made out of ice and a trade fair of the native handcrafters will be open for business. The number of incomers are increasing each year and about 1200 vehicles, 70 handcraft traders and 100-200 foreign tourists have came to the last year's festival, totaling 6 thousand people. February 23 (news.mn) During March, the Ministry of Environment and Green Development will be organising an interesting series of events entitled 'The Nomadic Winter 2017'. The series will open with an 'Eagle Festival' at the Chinggis Khaani Khuree camp on 5th of March. The camp, is located not far from Ulaanbaatar. Every year, just as the winter hunting season is getting underway, ethnic Kazakh golden eagle hunters gather from all over Bayan-Ulgii province (western Mongolia) to celebrate their age-old tradition. Like traditional practices elsewhere in the world, hunting with eagles is on the verge of extinction, but in Mongolia the tradition is alive and well. Then 'Blue Pearl-2017' ice festival will be held on 2nd-5th of March in Khatgal soum of Khuvsgul province, located at the southern tip of the beautiful Lake Khuvsgul. The lake is truly beautiful and is an ecological gem. Containing 70% of all fresh water in Mongolia, it is 262 meters deep and surrounded by breathtaking scenery. The series will end with a 'Camel Festival' on 6th-7th of March in the Bulgan soum of the South Gobi province. Tourists from 86 countries have registered to participate in the festival. The Thousand Camel Festival, held amidst the dazzling scenery of the Gobi Desert, is a celebration of the endangered Bactrian camel and the important role it plays in the lives of the Gobi's nomads. Camel races and polo competitions, as well as performances of traditional Mongolian music and dance, are among the highlights of this annual event. February 22 (UB Post) The annual Camel Festival 2017 will be held on March 6 and 7 in Bulgan soum of Umnugovi Province. During the two-day event, camel polo contests, an anklebone shooting competition, photo exhibition featuring photos of Mongolian camels, and traditional music and dance performances will be organized. Camel herders from around the country will come to attend the festival with their camels. The Camel Festival has already become a popular event among tourists. Ten thousand camels will gather and parade in the opening ceremony. The first camel festival was celebrated in 1997 by Umnugovi residents to promote Mongolian camels to the world and protect the species and pass on the rich Mongolian camel breeding heritage to the next generation.